Just a few bits of correct information about the real truth about guns and the results of lawful ownership in our society. I am now officially a member of the Board of Directors for Pima Pistol Club, located in Catalina, Arizona website at http://pimapistolclub.com/. I grew up in Catalina and have been an off and on member at Pima since 1970 as my career in Law Enforcement moved me though different towns and areas of the state. We have a new majority on the board who have varying backgrounds and interests in the shooting sports. We have a retired U.S. Marshal who is one of the four other persons, including myself, coming from a law enforcement and training backgrounds. We have two owners of firearms businesses, again including myself. The other fellow has a very interesting business you can see at www.pyrocowboys.com. There are Arizona and New Mexico State Pistol Champions, we have certified NRA Firearms and Police Firearms Instructors along with certified NRA Range Safety Officers and Match Directors, IDPA Certified Match Directors. A new Board Member is the Chapter President of the “Well Armed Woman” which promotes, trains and encourages women to enjoy the shooting sports and self defense involving firearms. What beings everyone together is the love of the shooting sports, hunting, wanting to improve and train in the use of firearms in a safe and family friendly environment and just plain plinking. We have a lot of good ideas for the club. Our board meetings are at the Pima Pistol Multi-purpose room on the second Tuesday of the month at 6:00 PM. The public are invited and please feel free to attend and share you thoughts, concerns and ideas for the direction of the club and shooting interests. Pima Pistol has grown to over 1200 members and has a high standing and recognition as being a premier, well run, shooting facility. We have several small business NRA Certified Instructor training companies for a wide selection to choose from to improve your skills. So come on out and see what we’re about. Murray’s Firearms and Ammunition is the trusted choice for firearm training in Tucson. Our current Tucson firearm and ammunition training classes are listed below. Classed offered for training individuals or groups for church and school armed teachers and security. Classes will be catered to your needs and fees will be based on those needs. Contact us at murraysfirearmsandammunition@gmail.com for more information or call 520-544-2660 or 520-235-3213 to discuss your security requirements and needs. Arizona Concealed Carry Classes, Originally Prepared by the Arizona Highway Patrol and The Required Instruction Course. We are Law Enforcement Officer Safety Act Certified Training Instructors; (LEOSA; HR 218.) Call 520-544-2660 or email us for questions and to schedule training. murraysfirearmsandammunition@gmail.com Fee for LEOSA Qualification Certification is $50.00. Concealed Carry Classes. Originally developed and required by the State of Arizona Highway Patrol for the Concealed Carry License. This class covers a lot more than other classes offered for the same permit courses provided by other outlet franchises and gives you a better understanding of your rights and what to expect under the law. Next Class will be in Tucson, (Oro Valley), AZ, will be held on April 20th from 8:00 AM to 2:30 PM. May’s class will be on the 18th. Please contact us for details to reserve seats for these classes, murraysfirearmsandammunition@gmail.com. “Having introduced laser instruction in our classes allows us to work with anyone wanting to develop their grip, trigger pull, stance and or sight alignment before ever getting out on the range. Even better, the laser system allows our students to become familiar with their own pistol and shooting that pistol without the need for live ammunition. Laser instruction is given within the classroom. Once the student exhibits the proper technique on the laser course we then progress to a live range and have the student become familiar with recoil and other aspects of shooting. Give Murray’s Firearms and Ammunition gift certificates. For more information contact us at murraysfirearmsandammunition@gmail.com. We offer training for individuals and groups for all firearms disciplines, though the NRA Courses or through our own training programs. For one-on-one or small group training, please contact us so we can build a customized training course for your specific needs. 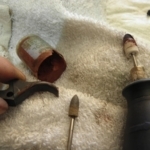 Firearms Maintenance class in Tucson, (Oro Valley) AZ, where we will teach you the correct methods of disassembly, cleaning and long term storage of your firearm(s). The class will be limited to five seats and you may bring two firearms to the class unloaded that you would like to learn how to maintain. It will be a four hour class starting at 9:00 AM to 1:00 PM. The fee for the class will be $75.00. Please email us for further details. We will supply some cleaning material but you will need a cleaning kit for the type of firearms you wish to learn to clean and maintain. Email us at murraysfirearmsandammunition@gmail.com for details of what kits you may need and payment options. All classes can be scheduled to your needs. You do not need to wait for a class date or to go to the NRA Instructor website to sign up. Contact us and we’ll work within your needs. Firearms Instruction Class on the M4/AR rifle systems; disassembly, maintenance, accessories, magazine and optics options, gas impingement versus piston operation, rifling twist rates and various caliber offerings. It will be a four hour class. You may bring your rifles to the class unloaded. This is an informational class on America’s most popular rifle. It will be four hours long and the fee for the class will be $75.00. Email us at murraysfirearmsandammunition@gmail.com for details and payment options. Firearms Instruction Class on the AK47/AK74/AKM rifle systems; disassembly, maintenance, accessories, magazine and optics options, various caliber offerings. It will be a four hour class. You may bring your rifles to the class unloaded. This is an informational class on Kalashnikov’s rifle, the most mass produced military rifle in history. It will be four hours long and the fee for the class will be $75.00.
. Email us at murraysfirearmsandammunition@gmail.com for details and payment options. 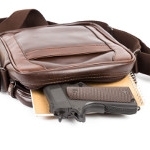 Understand there are good, better and bad ways to carry a concealed firearm. In forty plus years of carrying a firearm for protection, as an officer and as a citizen, Darrell Murray has tried them all. Before you go out and spend money on holsters that may end up sitting in a drawer, come see what’s offered and works best for men and women. Brenda Murray is an NRA Instructor and Concealed Carry Advocate experienced in many methods women use to meet their needs for carrying concealed. 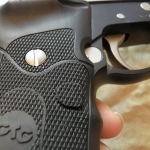 We offer a concealed carry method and holster class. The class is about two to three hours long and we’ll discuss types of concealment carry holsters. Fee for the class is $40.00. Contact us at murraysfirearmsandammunition@gmail.com for more information and to set up a date for instruction. 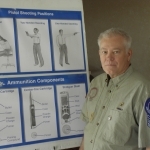 Our NRA Instructed Classes can be found at nrainstructors.org. Fees and class dates are listed. To sign up follow their instructions and we’ll email you additional information concerning payment options. We offer courses in NRA Course in Home Firearms Safety, in Tucson, (Oro Valley), AZ from 9:00 AM to 1:00 PM. To sign up for the course; https://www.nrainstructors.org and look for classes in Oro Valley and Tucson Arizona with Murray’s Firearms and Ammunition as the provider. Class fee is $65.00 per person. Or call 520-544- 2660 by credit card or email us at murraysfirearmsandammunition@gmail.com for other arrangements. Class size will be limited to eight seats. Look for our classes on Personal Protection in the Home and Personal Protection Outside the Home. To sign up for the courses; https://www.nrainstructors.org and look for classes in Oro Valley and Tucson Arizona with Murray’s Firearms and Ammunition as the provider. Or call 520-544- 2660 by credit card or email us at murraysfirearmsandammunition@gmail.com for other arrangements. Payment of class fee of $150.00 for Personal Protection in the Home and class fee of $200.00 for Personal Protection Outside the Home can be made by contacting us at 520-544-2660 by credit card or email us at murraysfirearmsandammunition@gmail.com for other arrangements. Class size will be limited to four seats in each class. 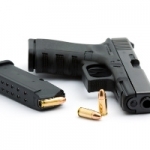 Basic Pistol Class, starting at 0800 AM and ending around 5:00 or 6:00 PM. Class fee of $125.00 per person. Limited to four seats. To sign up for the course; https://www.nrainstructors.org and look for classes in Oro Valley and Tucson Arizona with Murray’s Firearms and Ammunition as the provider. Or call 520-544- 2660 by credit card or email us at murraysfirearmsandammunition@gmail.com for other arrangements. Payment of class fee of $125.00 can be made by contacting us at 520-544-2660 by credit card or email us at murraysfirearmsandammunition@gmail.com for other arrangements. Class size will be limited to four seats. M+M M10 Side Folding AK with Krebs extended safety, Aimpoint red dot, 40 round magazine and vertical grip Firearms set up for customers and family as personal home protection platforms. POF 415F Piston Driven 5.56, with 60 round surefire magazine, Vortex 1x6 red dot optic, Sig red laser and light mounted in foregrip. 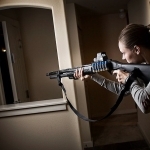 Firearms set up for customers and family as personal home protection platforms. Tavor X95 with Streamlight TLR-2 Green Laser and Strobe light, Sig Romo instant on Solar and battery powered red sot sight. Firearms set up for customers and family as personal home protection platforms. 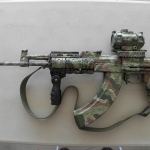 Arsenal AK Pistol, Green Laser, 400 Lumen Light, with Burris Fast Fire III red Dot Sight. Firearms set up for customers and family as personal home protection platforms. Brenda's Walther and Hornady .380 Personal Defense Ammunition. 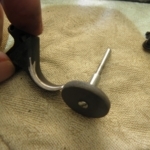 Trigger is rounded and stock ribbing was removed. Note the Sig P220 trigger is shaped differently than the P228. 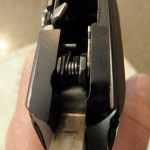 This is the P228 Trigger. End result of our Sig Sauer P228 Build. Robar NPS plating on Sig P228 parts. 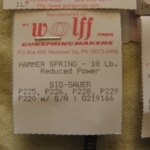 Wolff Springs used in replacing stock 24 pound hammer spring with 19 pound Wolff hammer spring. 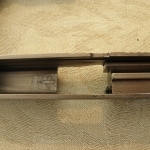 Barrel feed ramp polished and barrel lightly throated to ensure reliable and smooth feeding of all types of ammunition. Breach Block feed ramp polished to ensure reliable and smooth feeding of all types of ammunition. 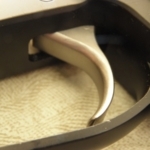 Trigger edge rounded and polished for smooth trigger control, no binding during trigger squeeze. Parts to be plated with Robar's NP3 Finish, Nickel impregnated with Teflon for superior self lubrication and resistance to wear and corrosion. 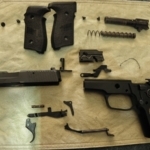 Sig is broken down to its basic parts for inspection and cleaning prior to tuning and plating. 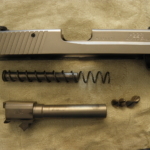 Sig is broken down to its basic parts for inspection and cleaning prior to tuning and plating. 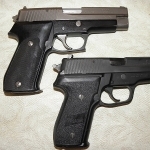 Original Sig P228 grips to be replaced with Hogue Extreme Aluminum Grips. Hogue Extreme Aluminum Grips, thinner than stock grips and much more durable and resistant to damage, excellent grip due to checkering. 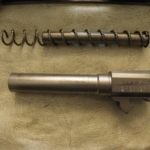 Barrel wear shown on Sig prior to plating. 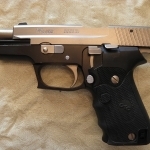 Our project pistol, Sig Sauer West German P228 9mm. 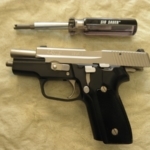 Hammer Bobbed on Sig P220. 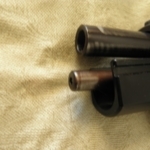 Enough hammer is left to allow a thumb strap to still hold the pistol securely in the holster, but not catch on clothing when drawing from concealment. 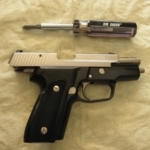 Sig P228 with NP3 plating from Robar in Phoenix, AZ with Laser Max Guide Rod Laser. 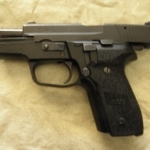 Note longer shaped P220 Trigger. 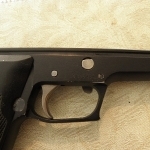 Triggers on the Sigs were rounded and smoothed removing the ribbing on the face of the trigger for a more consistent double/single action trigger pull. 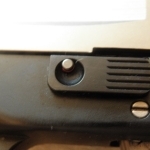 This is the P220 trigger. 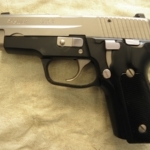 You can see the the Armoloy Hard Chrome Plating on the Sig P220, (Barrel exposed by the slide locked to the rear). There is no noticeable wear and tear on the the barrel. 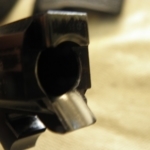 Here is a shot of the barrel's rifling. Rifling is still sharp and present, due to the Armoloy Hard Chroming process, inside and out, even after 60,000 rounds fired though it. 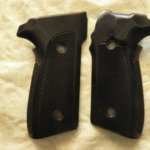 P220 carried and used for over 22 years. Switch for Laser Max Guide Rod Laser on P228. Crimson Trace Laser on Sig P220. 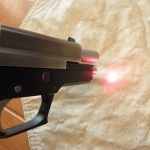 Crimson Trace Laser activation switch is located same area on both sides of grip. The laser is adjustable for point of aim. Laser Max Guide Rod Laser replaces your pistols guide rod and switch is located in a supplied replacement Sig Take Down Lever. 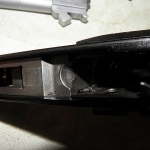 Shot of inside of Sig P220 and note Armoloyed barrel above. Breach Block is NP3. 60,000 rounds have caused some wear, note the anodizing finish on the aluminum frame is showing white as it has worn off. The NP3 however, has little evidence of wear and tear inside the slide. NP3 is a Nickel Impregnated with Teflon particles and is self lubricating, with a very low drag factor coefficient. While wear is noted in a previous photo on the frame, the rails however, have very little noted wear of the Anodized surface. Overall, the German Sig P220 has been a long lived and reliable firearm. So you can see why I stay loyal to my brand, so to speak. There are a lot of “Experts” on the internet who claim to “Know” how to instruct firearms and self-defense training. If you’re seeking out knowledge, the internet can be one of the best sources for it, but then again, stupid and downright dangerous instruction is just as abundant online too, even more so. I see the better instructor’s share videos these self-made “Gurus of Firearms Instructors” make and post online. Sometimes at first, I believe it is a joke and intended for a laugh, but then you realize these videos are of someone actually trying to impart training on inexperienced persons seeking to learn how to use firearms for self-preservation and protection and do so safely. Very scary that these people are out there supposedly offering solid firearms training and self-defense instruction to people seeking needed training and don’t know better. As a gunsmith, I often head to the computer to bring up suggested ideas for repair and disassembly of firearms I have limited experience with, but I do know how to tell apples from oranges, as there is a wealth of information available. All my gunsmithing repair manuals are pretty much gathering dust, but I still go to them often, as needed. But training is a different animal. As an experienced and a long term experienced Police and NRA Firearms Instructor I have a skillset I’ve developed as ideas come and go and improvements in training are advanced. In other words, I feel I have the ability to separate the “Wheat from the Chaff” so to speak. I’m open to new techniques and will learn them, but a lot of times the wheel is being reinvented. Something you see if you’ve been around a while. Seeing the curse of the Internet Guru Instructor’s videos has brought me quite a few laughs, but then, it deeply concerns me that people actually think they’re learning from these idiots and then if they’re paying them, their money is better spent elsewhere. A good instructor is worth paying for. The cheap one on one instructor or cookie cutter, mass training instructor, (The lone wolf guy who will accept training 20 or so students, but without help or trained assistants to keep an eye out for safety and correct technique), are not bargains. They are dangerous disasters waiting to happen. So how do you tell the difference? That can be hard as these so called “Experts” can be pretty convincing and tell a good story. Look at the reputation the instructor should have established. Longevity of training is another way, especially those who were Law Enforcement Firearms and Tactical Training Officers and those who served in specialized military units. We receive training that is intended to increase our odds of survival and it differs from NRA Basic Pistol, Rifle and Shotgun Classes. Those classes are good to get started in to learn the basics. The NRA classes are all good training and if you didn’t realize it, the NRA laid the foundation for firearms training at all levels of police and military firearms programs. Of course the police and military have expanded, broadened and train to suit their needs and have come up with specific instruction addressing their missions. For one thing, military training is aggressive and offense preparations suited to attack and destroy an enemy. Police and civilian training have more to do with defensive and reactive training to an attack or threat. You as a citizen are not out to destroy a threat, but to defend reasonably, to save your life and possibly other lives within the laws of your jurisdictions. So there is a difference in the skillset of training between military soldiers and the civilian world training to include police and the average citizen. Not that you cannot learn both, but you will need to learn the difference and how it is applied in the use of force. In short, you really have to do some research into the instructor and their abilities. Ask around and find out what people say about the instructor. Understand too, while some instructors attempt to give a better deal on pricing to their students, it always doesn’t mean the instructor is a good instructor. Find out first before spending your hard earned dollars. Pricing usually is not the issue, but the quality of the instructor is. Pricing is pretty competitive. A lot of “Experts” out there fishing for your dollars. As I conduct recertification training for LEOSA HR218 which allows current and retired police officers to carry in all states, (Although some states are being real jerks about it, sounds like the “Blues” to me), I get to see a lot of cops who learned their skillset from their departments in other jurisdictions and outside of Arizona. I’m surprised by the low standards some of these departments have for their training and the lack of abilities the officers have in their skillset. When they’re faced with the Arizona required qualification course for LEOSA, they are astounded by the course of fire and amount of ammunition needed to qualify. I guess being in Arizona and a “Red” state comes as a shock to them in more than one way versus what was required of them in their state and departments firearms training programs. Essentially it is your responsibility to obtain training in the use of firearms. We understand that, but sadly it is still a challenge to find the right and skilled instructor. What makes it hard is the “Internet Guru Instructors” spewing out “Training” that they’re passing off as valid methods of instruction. You have to separate the “Wheat” from the “Chaff.” Spend a little extra to learn from the best. Remember, you get what you pay for and watch out for those “Gurus”. Stay safe and ready. This month we’re going to talk about bedside manner. (Not that kind of bedside manner!) What did you think I meant? This has to do with firearms and self-defense. If you have children or persons who cannot be around firearms safely, this is not for you. You will have to secure firearms from access and there are a lot of options out there that will work for you. This is for folks, in like my household. All adult children, family members, no grandkids all of which, including outside the immediate family members and friends we associate with, are adults who were raised around, trained with and use firearms. These adults are comfortable with seeing firearms, don’t panic or whimper in terror, looking for a safe place to hide and honestly, have taken time to teach their children safe use of gun handling. In other words, were the sheep dogs, not the sheep, type of adults. I often criticize people who tell total strangers, i.e. through their Facebook friends, what kinds of guns they own and go one up on each other while doing so. In my case, it’s moot as I am an FFL dealer and law enforcement, so you know we will have guns. Just a given we will. But I would advise any criminal they will be met with deadly force, as we are owners who train, use and shoot our firearms regularly. So I accept that we may be a target of criminals and home invasions, but likely it will end very badly for anyone who attempts such an act against us. We are prepared. So here are some tips to help you prepare against the scum of society, some of which you may already have figured out already or been advised by fellow shooters and law enforcement, as to simple ways to up the ante for your survival. I suggest having a tactical rifle, outfitted with a high capacity magazine, available in your domain. If you should choose an M4, or AR type platform, make sure you purchase reliable magazines for use with the rifle. Old Vietnam era mags are only good for practice. They do not work reliably and malfunctions are common. Spend a little extra and purchase Mag Pull magazines, just like the US Marines use. Very reliable and they work. Depending on what type of 5.56 platforms you use to deliver the rounds, make sure the magazines fit, function and drop feely when changing empty mags out. Find and stick with what works. Spend a little extra to do so. When you decide to load ammo into those magazines, what kind will you choose? Realize, if you truly have a .233 chambered rifle, 5.56 ammo may jam in the firearm. Usually the truth is, not many modern AR platforms are .223 anymore. Only older AR’s out there are chambered for .223 and that is a problem when you use 5.56. You can still buy and find .223 AR’s but those commonly sold are 5.56. Understand there is a difference. Now that we’ve got that out of the way, what kind of ammo do you want to feed your tactical rifle? What you need to remember is you are not a signer or participant of the Geneva or Hague Conventions so why use full metal jacket ammo? Yes it is often cheaper, great for practice but you can use something that is better for self defense. Hollow points, soft points and even frangible ammunition are available for you to use in your tactical rifle. Years back, Hornady Ammo made an explosive varmint bullet that had a jell based substance, behind a soft point tip. I don’t know if it is still available, but it was very destructive. I used it in hunting coyotes. I had to stop as it was so destructive it ruined the hides, which I was harvesting and curing for government purchases. They used them in military parkas. What I also add to the magazine, is military tracer ammunition. I would load the first three rounds with tracer to help guide shots onto the threat. Then every third round was a tracer for the same reason. At the end of the magazine I loaded three rounds of tracer to let me know it is time to change out magazines. Whether you should do this depends a lot on your locality and laws of your state. You can also expect a lot of grief if and when you may have to use the firearm for self-defense against a home invasion. Liberals and their cohorts don’t like you prepping for trouble. They try and turn the tables on you, making you look like a bad guy for preparing for the worse. All I can say is keep your mouth shut, get a good lawyer and call on experts in the field to testify on your behalf if it comes to that. That also means buying good insurance. Outfit the rifle with a laser and a high intensity flashlight. Add a red dot or holographic sight too. There are self-illuminating red dots that come on when you pick up your rifle, such as a Sig Romo sight. This gives you a passive sight on the threat without giving away your position, until you want to. There should be a momentary switch so you can turn the laser and light on and off very quickly. The flashlight will blind the bad guys and the laser will intimidate. A laser will help your aim too. The flashlight will help you identify the threat. Other rifles to consider; I have and like the AK rifle platform. They work and fire an effective round, either the 7.62×39 or 5.45×39. Again you can obtain both rounds with hollow point, soft point and even frangible ammunitions. You can load tracer into the mags as well, dress them up with a laser and flashlight. The big issue with these rifles is they are not as ergonomic as the AR rifle platform rifles. 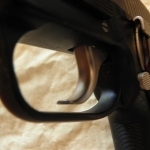 They do not lock open on the last round and the charging handle is on the right side. I charge the rifle by twisting the rifle horizontal, with my strong hand on the grip, then reaching over with my weak hand to rack the bolt. It is fast and it works. I use to say the AK always worked, it still does, but the reliability of the AR platform, in its’ current configuration, has come a long ways towards improving reliability so now they’re very viable rifle for self-defense. The important thing is having the rifle ready and available when trouble comes kicking in your front door. If you have little children, grandchildren, family members with dementia, you cannot leave the firearm as accessible as you would like for when you need it. There are quick access devices you can use to store your rifles, at the ready, for your defense and you would be well advised to research and determine which will work for your circumstances. Most importantly, keep the rifle handy and don’t do any bragging with friends that you have it and why. The liberal attitude is the more you prep and make ready, in their eyes, shows you are chomping at the bit for the poor, misguided criminal, to enter your home just so you can kill them! Especially if you’re “Bragging” about being prepared and ready, or saying things like “I just can’t wait until someone tries to come through that front door!” “They’re dead meat! !” Don’t do it. Keep your mouth shut and get rid of signs that say things like, ‘Trespassers will be shot and survivors will be shot again!” They’re cute, but when you end up in court, (You will) they will be used to set up the case to present you as a blood thirsty killer, rather than a homeowner who survived a home invasion by good training and preparation. Remember; NEVER use a firearm to deal with criminals UNLESS your life, your wife’s life, loved ones lives are in immediate danger of serious physical harm or death. It just isn’t worth it. However, also understand this; it is your god given right to live free from aggression and harm. You have a right to defend yourself and an obligation to protect your family and loved ones. Sometimes that is extended to others needing help as well, but only in defense of their lives. It is a fine line to cross and you had better be the one in the right, there can be NO mistakes. But also realize, to hesitate can mean failure and defeat, even death. Stay safe and ready. Firearms business is good; US Economy is good, in spite of what the Communists of the Democratic Party have tried to pull and are still planning in their line of attack. I would say our nation is headed for a rough ride, similar to the kinds of events that led to the Revolutionary and Civil Wars, but the question is who are the good guys? Certainly not the Democrats who want to kill babies right up to birth and openly passed such laws in NY and tried to do so in Virginia? The same ones who want to give over our country to illegal aliens and say “Think of the suffering illegal’s children?” Kind of lost me there, but I’ve given up on thinking anybody who voted for the liberal left has any morals left or sense of patriotism. Now then there’s Republicans who bow and give into the left’s demands and waver at their every “Reasonable” demand, never growing a back bone or standing up for what is right for America? Too much B.S. of political correctness. It’s to the point we have forgotten it is okay to have a difference of opinion and be a man who loves a women and oppose homosexuality as being a “Normal” behavior. Well that’s not what this newsletter is hashing over this month. But we had to set the atmosphere, of well, what too many of us are now living with today. Trump supporters are openly assaulted. People are being dragged out of their cars by ANTIFA and roving black teenagers who hate Trump, their property stolen or destroyed. All this by the useful thugs of Communism or just plain Communists/Socialists/Liberals in particular? These tactics are all out of Stalin’s and the Communist play book, which occurred decisively in the Pre-World War II days. It brought Hitler to power. So now we had another evil socialist to deal with and that we did. I guess what I’m offering up is that today’s world is rapidly becoming so evil; it’s being forced upon us to either bow down to these thugs or prepare to defend against them and protect the principles of decency and the Republic. So where do you begin? In the past two years, firearms prices, ammunition costs, magazines, all have been at a record low for the past 10 to 15 years. The time to buy your M4 rifle, (tactical rifles) magazines and ammunition has never been better. Who knows how long that will last with the witch Pelosi and her Communist cohorts? So if you live in one of the “Blue” Leftist states where such guns are heavily restricted what do you do? Get the hell out and move to where you can live an almost free life. Cuomo already told you to leave NY. Do you think any other of these leftist cities and states want you there too? Sorry. Maybe it is time to cut your losses and leave, or prepare for the worst. Your choice. Just don’t bring the leftist agenda with you if you choose to leave! So getting back to needed preparations. If you have served in the military, even as far back as Vietnam, you are a step ahead of citizens who haven’t. You have basically been trained on and handled the AR rifle platform and likely will only need a little bit of familiarization to get reacquainted, if you already haven’t done so. If you have known me, I am a fellow who trains on several tactical firearms of which I enjoy the AK rifles best. But that is not a practical thought in choosing a tactical rifle for defensive reasons. It’s mostly just for fun. In a practical world, in the US, the AR rifles systems are used by the population, the police and military. Supplies of ammunition, magazines, parts and rifles are all over the country, even in those leftist blue states too. So that rules out many firearms that are very good for tactical defense, but are not readily supported. Sorry guys. Then again, if it’s all you got, then that’s it. If you already have some of the semi auto rifles made in history by our allies and enemies, you use what you have. A bird in hand….right? In the matter of high capacity magazines, both for rifles and handguns, have a bunch. As many as you can afford, but a basic loadout should be seven per rifle and three per handgun. You cannot have too many as they are something that can and will fail. Don’t buy off on the leftist crap like Joe Biden says, you only need a double barreled shotgun, blah, blah, blah. I have yet to see ANTIFA, groups of leftists’ violent demonstrators, home invasions out in less than one or two people. There are dozens and more and I’ll be darned if they’re going to drag me out of my car and beat or kill me. You need the ability to meet, resist and defeat such an attack and firearms, ammunition and hi capacity magazines to do so. I’m not saying drive around in your car with your M4 or AK, but you can, if you’re smart, have with you and trained with a high capacity magazine pistol. The M4 or AK is more for you defense of home and business, or if it comes to it, life and liberty. When you hear conversations concerning the need for these rifles and so you can never fight the police or Army, I smile. That has never stopped it from happening in history and it continues to this day in regions all over the world. Armed populations fighting and resisting tyranny.. Some of whom took their firearms from the police or military or were joined by said police and military. I’m not talking about rebellion, just pointing out how asinine such a train of thought it is, that it can’t happen here or you would stand no chance if it did. If you follow that course of thinking, you’ve already given up. The left thinks you have, but they kind of live in a world where they just can’t believe there are people who oppose their views and form of governing. They just won’t believe it. If you look at the political map, the left has control of NYC, some other blue cities and parts of CA. It might be a lot of population, but not the country. AND this is a Republic; it is not ruled by a majority vote, although they, the left are trying to change that. These regions are populated by all their useful stooges right? Not individual thinkers. Your right as an individual is paramount. They hate that line of thought. BUT that right has been gradually crumbling away over the past 100 years. The left thinks now the time is right to abolish the Constitution and Second Amendment. To take final control over the greatest nation in history. Sorry, not on my watch and certainly not on yours either. As far as the AR rifle platform, (M4), it has come a long ways from Vietnam and today is a very sound and reasonably reliable firearm. I have mine with a piston driven action, which is about the only improvement I would continue in the evolution of this rifle. The most common AR rifle available is gas impingement and I feel one of the issues concerning reliability with the rifle. They work fine if kept well cleaned and oiled. The piston driven AR’s don’t have gas impingement issues. Trouble is, cost wise. If we’re looking for a reliable system and you have the money, go for the piston driven AR’s. Right now, however, the AR kind of rifle, the gas impingement kind, can be purchased for less than $500.00. I suggest using the internet to get various opinions of the available rifles as there are dozens of makers. It is a matter of choosing a Ford or a Chevy, both will get you there but each have their own following. I’ve found that today’s M4 magazine, versus the original military spec magazines from the Vietnam War, are like comparing a modern car to a Model T. They work, but just don’t perform as reliably as what’s available today. I favor the Magpul magazines if you want to know. Also the go to rifle is a POF 415, made right here in Arizona. Piston driven perfection. The ergonomics of the M4 rifles are dialed in and they are very fast to handle, reload and fire. All important issues when considering your choices. There are other rifles that are just as good as the AR and even use the current issue magazines for the US Marines, which are the Magpuls. More, later about these rifles. 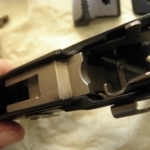 A Magpul magazine will set you back about $15-$20.00 each, depending on if you buy one or in bulk. Ammunition available for the M4 rifle is 5.56×45. Some will call it .223, which will work, but they are slightly different. Another caliber is called .223 Wylde. There are many more calibers available but we’re not discussing the versatility of the rifle, just what’s readily available in quantity The Wylde is an attempt to give you more accuracy out of the rifle barrel while accepting both the 5.56 and .223. At a minimum, you should choose a 5.56 barrel. There are different rifle twists, such as 1 in 7, 1 in 9 and so on. The slower rate of twist is needed to stabilize a heavier bullet, such as what is available and used by police, 77 grains. 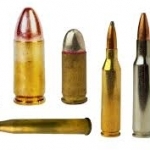 The standard bullet weight for most 5.56 is 55 grains, but today’s US Military bullet weight is 62 grains. A 1 in 8 works well with that weight range and even can handle the 77 grain bullets. A smaller bullet, say a 40 grain, would need a 1 in 12 rifle twist to stabilize. Most makers sell their rifles with a 1 in 8 or 1 in 7 rifling twist. The first number means one revolution of the bullet and the second means one revolution in seven inches, or eight inches and so on. It has already been pretty much decided for you already, about the bullet twist rate and commonly used bullet weight, but there will be observant persons who will want to know or will wonder what those numbers mean so hopefully I didn’t confuse the issue too much. I was recently at the range and saw a fellow loading his magazine for his AR rifle. He was pushing down and sliding the round back under the magazine lips. I showed him the correct method of loading the magazine. You place the round on top and push it straight down into the magazine. A lot easier that way. Most tactical rifle magazines will load that way. 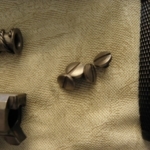 Ammunition can come in stripper clips with a feeding device to push rounds into the magazine and there are even tools that will load the rounds very fast. It all depends on your budget and how much you want to spend. I, myself am usually pushing the round down one at a time. I have stripper clips and a feeding device, for quick loads but honestly, I have an abundance of already loaded magazines. With today’s steel, springs, magazines do not lose their tension. You can keep magazines loaded for years and not have any issues. Do I do that? Not really. I’ll switch them out annually and give them a rest, an old habit. But just for reference, I left one Chinese AK 47 magazine loaded for 30+ years, took it out and fired all 30 rounds no issues, as fast as I could pull the trigger. I had stored it that way just to test the idea that today’s steel springs hold their memory. If the Chinese can do it, well…..I figure our country’s producers of steel have it down too. Other tactical rifles are fine, if they use 5.56 ammunition and M4 magazines, like the Israeli Tavor X95 for instance. Rifles in 7.62×51, (.308), like the HK/PTR 91 or M1A are fine, but 7.62×51 is not a commonly stocked ammunition in the bulk form and is costly to acquire however, magazines for the HK/PTR are inexpensive and still readily available. The benefits of the more powerful and longer range of these rifles are obvious, but unless you intend to arsenal up, having enough ammo on hand to deal with resupply will be difficult if the S**t hits the fan so to speak. The same issue exists with the AK’s, stock up if that’s your choice. The original two calibers of the AK are 7.62×39 and the more modern 5.45×39, the Russian’s M4’s equivalent reduced caliber round. I haven’t talked about shotguns as a lot of police have stopped issuing and carrying the 12 gauge shotgun. Its replacement has been the M4 rifle. So you’ll have issues with ammunition unless you acquire and store it. Handguns are more of a personal preference, but Glock dominates the civilian and police segment. Caliber should be 9mm, for whatever pistol you choose for a handgun. In my career as a Highway Patrol Officer I carried a Sig Sauer P220 in .45 Auto. Not so common anymore. So I carry a P228 in 9mm as I am overly familiar with the Sig “P” model platform. Some makers are providing tactical rifles in 9mm that use your pistol’s magazine and for those of you on a budget that may be a good choice. 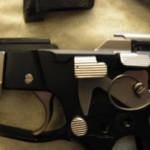 Don’t forget the add on accessories for your rifles or handguns. Things like night vision, lasers and flashlights are lightweight and reasonably affordable. Don’t forget batteries and they should be of a more commonly available source; these accessories will not do you any good if you cannot find batteries. You will need gear to carry this stuff around; if that is your intent. The current available market for gear is swamped with useful items and you should shop for the best pricing and research what will work best for you. Maybe take a class or talk to a professional and seek their advice. I’m not telling you to prepare to attack our government or the military and police. Far from it. I consider myself, a law abiding patriot proud to be an American and a Conservative. A Patriot for a condensed version, but when Tyranny rears its’ ugly head, there may come a time when decisions will need to be made. Honestly, if the left would leave conservatives alone, there would be no problems, we’re not the ones trying to exert our will on others. They just can’t seem to warp their minds around individual freedoms, free enterprise and capitalism. Everything must be under their control. They can’t succeed without a disarmed and defeated population. I seriously believe liberalism is evil and a mental health issue at a minimum. “Communism/Socialism/Liberalism” has killed more people in the last century. By the millions. They have nothing on Hitler. It’s scary that today’s youth think socialism is the answer. They have not been taught of the past sacrifices made to keep our nation a Republic and the world free of tyranny. History repeats itself. Don’t let them win. Stay safe and ready. Here we are, into a new year with a leftist congress who wants our guns. Thank god they don’t have the Senate and Presidency. I will state this. The attacks by the Democrats on yours and my rights, for the next two years, will be the worst we’ve seen in the last 10 years. All just because we have a president who wants the best for Americans by putting America first by securing our borders against terrorists and illegal aliens and by allowing capitalism to flourish. The left hates him and us. So folks, be prepared. Socialism is a beast. It has destroyed countries throughout history and if we’re not careful it will get us too. You’re seeing lines drawn in the sand by the enemies of our country. That’s right I called them “Enemies.” The Democrats no longer have control of their party. It has been hijacked by Socialists, Communists and Leftists of all ilk and they’re going all in to fulfil their agendas. They have one, huge problem however. Americans are gun owners and are armed. We love our freedom and our guns. We love the Second Amendment and most of all, we love the Republic. The left hates that. Their version of “Reasonable” gun control, (There is no such thing), is the total ban and confiscation of all firearms. They’ll start by chipping away at your Second Amendment rights, bit by bit. You’ve seen this happen in the “Blue” states. Most recently by claiming we have to ban these horrible military style rifles that no citizen has any right to or needs to own. Tactical rifles, when it comes to deaths, (All rifles actually), are below knives and blunt force instruments. About 1.8% of deaths in this country by illegal means are caused by “Assault” rifles. But yet they’re a priority on the hit list by the left. If you remember, they tried this with handguns during the 1980’s through the 1990’s. Didn’t work then and we can’t let it happen now! The so called “Assault” rifles are semi-automatic firearms and similar to several other hunting rifles in use today and available, having been so since the 1920’s, for civilian use. They just look bad in the eyes of the left and are a target as they have not been a great percentage of ownership by gun owners, but that’s changing. The AR rifle platform is now used in hunting all over the nation, where it is legal, as some leftist states prohibit it. 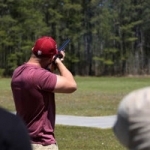 More and more people are buying and owning them for all sorts of fun shooting sports, including hunting and ultimately home firearms for self-defense. The Democrats hate this, but the AR is now becoming the most popular rifle in America. And why not? It is very versatile and easily had in many calibers and often only requires changing the upper receiver to accommodate the caliber change. Some of the things AR’s are also good for is for personal, home protection. Opps, you mean to defend against a criminal threat or home invasion? Yep, that’s right. But you can’t shoot criminals right……at least that’s what liberals want you to believe. They want you to think you have no right to self-defense and to protect your family. Just look at the laws governing the use of force in blue states. They often deny even the basic rights to protect yourself from criminals. They deny Stand Your Ground and Castle Doctrine laws to their states’ residents. Kind of defies logic but that is typical liberal thinking isn’t it? The other thing that sets them off is Tactical Rifles can be used to prevent tyranny. You mean to resist the “Lawful” government? No, but certainly, to resist a leftist government that threatens your very existence and rights to freedom, you bet. That type of government that would exist under those Democrats, actual Socialists or Communists, shouting out about doing away with the Second Amendment and forcibly taking our firearms! (They won’t stop with tactical rifles), that government would cross the line and in the word of our forefathers, will have become tyrannical. Thomas Jefferson said, “The tree of liberty must be refreshed from time to time with the blood of patriots and tyrants.” That’s what they wrote the Second Amendment for and the Socialist Left hates it. These same leftist politicians have pushed and put laws in place called “Red Flag” laws which allows the government to come and seize your firearms without due process. Only based on the word of someone who accuses you, maybe because you don’t approve of their lifestyle and made a mistake voicing a non-political correct statement or opinion. Rather than have solid proof, just the mere word of who knows who? Really? It sounds like the Communism condemn your neighbor practices in the former Soviet Union or now China, North Korea, to name a couple of the worst. We have a Constitution like no other nation. Yes sometimes the bad will slip through the cracks, but you can never legislate total security without total loss of freedom. So you will have bad things happen. To remain free and keep those freedoms, you cannot legislate laws that take away those freedoms. It’s not because of our “Lack of laws” but because we have evil and bad people. They exist. Always have and always will. The history of man is full of it. Communism has killed more of its nation’s citizens, 20 million by Stalin, which is more than Hitler’s 6 million Jews. But to be fair, they say 11 million died in Hitler’s camps, not just Jews but other civilians as well. Both men were evil, but Stalin was an ally in WWII so we looked the other way. These types of government should never be allowed to exist in the world, let alone in the USA but the danger is there. The so called Democrats are preaching it. “Kill the NRA.” Seize guns and kill those who resist. Sounds very similar to Hitler and Stalin, doesn’t it? Don’t be fooled by Democratic Rhetoric. It’s not them anymore. Their leaders are being replaced by radical Socialists and Communists. At a minimum, they are corrupted and being used by the same character of people who led Nazi Germany and Communist Russia, along with Socialism elsewhere in the world. Stay alert to the attacks and attempts of law changes and threats to our freedoms. Fight at the ballot box, but understand, this is a ruthless enemy and is well versed in blaming conservative values for the ills they foster. They are very adept at shifting the blame and outright lies. Yet when they cross the line just a little too far, they “Apologize” and that’s supposed to make it alright. But it is not a sincere apology only one of those “I’m sorry I got caught” apologies. Don’t believe them. For those of us in Arizona, watch Ducey, he is attempting to push his failed “Red Flag” bill to be reintroduced in the state legislator again during 2019. Make sure you let them know it is NOT acceptable and NOT needed. We beat it last year and will do so this year. And this guy calls himself a Republican? On a national note, understand the recent rule imposed by Justice through the BATFE is not good. Banning and calling “Bump” stocks machine guns? The issue isn’t their ban, but the wording which can be applied to ANY, semi-automatic firearms. Support the reversal of this rule as it is not a law but a “Policy” which threatens your rights! It is not a legal course of action by the people through the legislative process. The fight is never over and my friends, a big one is coming. Stay safe and ready. And in spite of the Democrats, have a Happy New Year. Well another year has gone by, a good one economic wise, thanks to the efforts of President Trump in reversing the rush towards Socialism and doing away with some of the environmental wacko executive orders put in place by Obama which was destroying free enterprise and Capitalism. Enough about politics though, but remember, with the left’s control of the House, you will see impending anti-gun legislation introduced bills in the name of “Sensible” gun control, which is not sensible, but a serious attack on your rights to defend against thugs and criminals. Oh well, I said already enough about politics, but I had to insert a gentle reminder to remain vigilant and oppose such legislation. So how about that economy! People are spending money again and enjoying a better way of life which hard working Americans are entitled to. So let’s talk about guns. Yes, that may just be the right present this holiday season and you have a husband, wife, son, daughter and so on you would like to introduce to the shooting world and maybe considering a firearm that can be used for hunting, plinking or self-protection. So how do you go about buying one? Aside from the background paperwork and the required 4473 to purchase you may have to consider a few other things to. Like can you gift a firearm in the first place? The answer in most states is yes, but there are states that prohibit giving a firearm to another person as a gift. They may require that you both go to your local dealer and have the person you wish to gift the firearm to complete the legal paperwork. A word of caution; Understand, federal law prohibits a “Straw Purchase” which is buying a firearm for someone else under false pretenses. Usually meaning that the person who is receiving the firearm is a person convicted of a felony or misdemeanor domestic violence or has been adjudicated mentally ill or defective. For obvious reasons these persons cannot own firearms. Check the laws of your state and in some places county or city. If in your state, be certain your gifting of a firearm does not make you a criminal. If you want to be safe, gift the money for the purchase to your intended, let them buy their firearm, but that sort of ruins the surprise. In Arizona, there are no restrictions for gifting a firearm, outside of the federal laws noted above. However, one thing to understand is you cannot gift a firearm to a minor unless you are the actual parent or guardian or you have received “Written Permission”, from both parents. Another federal law requirement but honestly, I have never heard of anyone being charged with this as a crime, but in this day and age, best to have the written permission. If living in other states, you had better check the state law as well as the federal law, OR move to Arizona! Better yet, vote those politicians out of office and get the laws changed! Now once you have ascertained you have met all the legal requirements, now you need to decide on what you want to purchase. If you have paid attention to your other half, you’d heard him, maybe her, talk about guns and what they like, but there are many different models of the same manufacturer, so it is important to understand this. For instance, a Glock 17 is a different model than a Glock 19. Then you need to consider what caliber, such as 9mm, .40 S&W, .45 Auto and so on. A little research or may just asking right out what they want may be your best option. 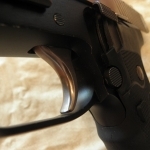 Things to consider in purchasing firearms; I’ve had a fellow end up buying three or four handguns over a couple week period and finally my curiosity got the better of me and I asked some questions, not about buying a lot of guns, (Really is four a lot! ), and he told me he was buying them for his wife. The issue was she either couldn’t pull the slide back, in the case of the automatics or couldn’t pull the trigger, in the case of the revolvers. It would have been easier and less costly if he asked me some questions first. There are some pistols you can work on and change springs out for a lighter recoil or work on the action to improve trigger pull, but you have to know which ones they are. It needs to be considered that reducing the recoil spring will cause more wear and tear on the pistol and not using extra pressure rounds. 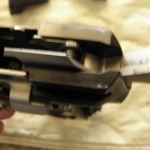 When you work on trigger pull, you need to understand the firearm’s maintenance needs to be kept up as it may hang up the trigger return if the revolver is not cleaned properly or lightly oiled. A lot to consider, but with a little understanding can be easily resolved. Everyone likes the little poly framed .380’s and 9mm’s as they are pocket concealable firearms. 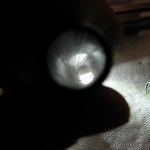 Often you will find ladies or older persons cannot operate the slide as they require a very heavy recoil spring to absorb the power of the fired round of ammunition. 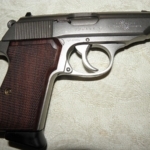 You will often find, with a full sized auto pistol, the slide is easier to operate than on the small pocket pistols. Partly because the slide is larger and more mass weight, and they have a lockup with the barrel and slide that releases after a certain amount of reward travel, allowing pressures to drop to safe levels. 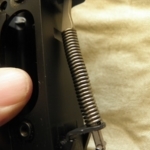 They do not require a heavy recoil spring to hold the pistol in battery longer for pressures to reach safe levels, as needed in the small framed poly pistols, which are often a straight blow back operated system. Now that I may have totally confused you, what it boils down to is seeing whether or not your intended recipient of the gift can operate the slide or pull the trigger. Again this may spoil the surprise. Another issue to consider it the actual felt recoil or “Kick” of the firearm. Going to be a lot more with a small poly framed pocket pistol in 9mm, than with a full sized 9mm pistol. Again overall mass of the firearm has a lot to do with this. You don’t want to go through all the trouble of making sure they can operate the slide or pull the trigger only to find the firearm is too painful for them to operate when fired. One of the bits of advice I tell people is to head to one of our local indoor ranges that “Rents” firearms. The local range here, in Tucson, will allow you to rent and fire any firearm in the caliber you want to shoot. So if you choose 9mm, they will let you shoot all the 9mm handguns they have available to shoot. They restrict you to using their ammunition in their pistols. Call your local range to find out exactly what they require of you to shoot on their range, prices and types of handguns available to shoot. When it comes to shotguns, especially for beginners, you can spend under $300.00, sometimes less than $200.00 for a pump shotgun and in some cases, semi auto shotguns. What’s great for kids to learn on, is usually a .410 or 20 gauge shotgun. They can be pump shotguns or even a single shot, shotgun, which may cost nearer to $100.00. 12 Gauge is the most popular, but it is also a hard recoil firearm and may discourage a new, beginning shooter. .22 caliber rifles are available in all sizes and actions, meaning a single shot rifle called “The Cricket” which can purchased child sized and even in pink for the little ladies, with little expense. 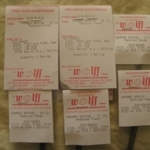 You can buy pump and semi-automatic versions of .22 rifles for less than $200.00. The Ruger 10/22 is the most popular .22 rifle in America and they sell for around $250 to $300.00. Other companies, like Savage, Mossberg and Marlin make nice .22’s as well for around $200.00 or less if on sale. Of course you can find Remington and other big name companies that make .22’s too. It boils down to how much you want to spend. Browning makes a lever action, rifle in 22 caliber, but now you’re getting at the upper end of cost, but they are fine rifles. My first firearm was a Browning .22 take down semi-auto and I still have it. It’s a little rough and has seen a lot of use. They still make it, but you’ll spend near $800.00 for one. A little costly for a beginning rifle, but they are one of the best. Giving your son or daughter, niece or nephew, their first firearm will create a lifetime of memories to share long after we’re gone and likely the new shooter receiving the firearm will always have it in their family as time passes. Getting the firearm is a gift they will cherish and in turn gift it to their son or daughter, or grandchild. Often that firearm will become a prized possession for the rest of their lives. On another note, I received a call from a woman whose husband passed recently. I handle estate sales and appraisals and the lady needs to sell his firearms as they have no children to pass them on to and she herself is deathly afraid of them. Her husband was a retired police officer. Her difficulty is she cannot get into the safes where the firearms are stored and was never shown where the keys for the safes are. The other difficulty is there is no will instructing her what to do with his estate or if there is anyone else in the family who he might want these firearms gifted to as an inheritance. She told me one of the firearms he treasured belonged to his father. I told her I would be glad to help but she should check into it a bit further, as you never know if some nephew, cousin or maybe one of his siblings may want it. It’s always tough when you lose a loved one, especially during the holidays. If you would like to see certain firearms you own passed down to family members, make a will saying who is getting what, or they may end up being sold or worse, given to the police to dispose of. Stay safe and ready. Here we are, November 1st, just five days away from refuting the left’s claim of fame and a “Blue Wave.” Not going to happen, going to be a Red Tsunami and let’s vote to ensure the “Tidy Bowl Blue Wave” flushes down the toilet where all the Socialist agenda belongs, in the sewer! Enough about the Dumbacrats losing, let’s get back on track with draining the swamp and dealing with real issues. When we talk about daily carry, there are a lot of topics to cover, laws that need to be obeyed and preparations made to do so safely and readily accessible for use. We’ve been “Seeing” more stories in the news lately about firearms being used for self-defense and preventing mass shootings. Reluctantly covered by the media, these lifesaving firearms related stories find their way into the news as of late. Take my word that there are a lot more that do not than do. The reason why? It simply proves the idea that an armed and trained citizen is the best defense against a criminal, but that doesn’t jive with what the media or liberal left politicians want you to believe. When it comes to protection in the home, you will hear a lot of different ideas about what is the best firearm to use. Not all these suggestions are correct and not all are wrong. You have to evaluate your own circumstances. It is very obvious that it would involve a different plan if you are a young couple with young children versus an older couple whose children are grown and on their own. If you have teenaged children who can use a firearm and you’ve need a plan on what they are to do if they’re encountering a criminal threat in the home. If you’ve done your job as a responsible gun owner and parent you’d have taught them how to use a firearm or had them trained by professionals. It depends on the laws of where you live. If you’re in a stand your ground, castle doctrine state, you’re pretty well justified in shooting an intruder on site in your home. The mere presence in your home makes them a threat to your life and these laws recognize that. One thing though, you just shouldn’t shoot just because you can. Even if the law sides with you on such instances, you may end up being charged with something like premeditated murder. Yes even in stand your ground and castle doctrine states that is a strong possibility if you shoot just because you can. You should be in actual danger and fear for your life or loved ones lives. Sometimes the mere presence of your firearm will force a retreat and the best shooting to have is the one you avoid. Even if justified criminally, you may face legal fees both criminal and civil costs which can be very expensive. Buy insurance specifically for this. Several good companies offer insurance including the NRA for this kind of liability for self-defense shootings. So what kind of firearm should you have to defend your home and family? Did I say firearm? How about firearms? More than one? Again this will depend on you circumstances. Like how big is your home? How many family members are there? How many children, teenagers or adults? Do they know how to use the firearms you plan on having on hand for defense of your home? How often do you entertain and have guests in the home or overnight? You should sit down and assess your home, family and strategy. You should have a plan for your permanent family members that live with you as to what to do or where to retreat and how you’re going to deal with an intruder or home invasion. Rehearse it. Not every scenario can be covered but practice will enable a better response and outcome. Some states have passed laws where you cannot have a firearm operational in your home what so ever. My answer to this is voting these assholes out of office or move. However, it’s your home. Prepare and arm yourself as you see fit, but be prepared to battle charges in court. You’ll be breathing and alive, but may end up spending time in prison and lose everything in the cost of defending your actions. So VOTE these idiots out of office and CHANGE their ridiculous laws. You can bet politicians are protected by armed security as they’re political figures, but hey that’s the left, “Do as I say, not as I do.” You can’t be trusted because you’re just a citizen, a commoner, you can’t make decisions on your own, so “We’ll do it for you” and “It’s for your own good.” These people should never get elected into office, shameful that they are. First what kind of firearm? A lot of people favor a shotgun. Pros and cons exist, one being the limitation of rounds and size of a pump shotgun. Most only hold four rounds. They are long and hard to maneuver through your home if you need to get to loved ones in other areas of a home, especially a large home or multi storied home. Those who say load the shotgun with bird shot and you’ll be fine. No, you need to guarantee one shot stops with a limited amount of ammunition so the shot should be number 4 to 00 buck but the issue here is there is a lot of kick and most often an adult male is the only one who can use it effectively. Anymore home invasions are often three or four criminals and those four shots may not be enough. One of the solutions to this is purchasing something like a Mossberg Shockwave, the small shotgun and installing an adapter for shooting mini shells. This increases the capacity from four to eight shells while still using number four, number one or 00 buck without the kick and recoil but with all the benefit of one shot stops and ladies or the elderly or even teenage children can fire and handle the recoil. 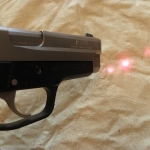 Attach a laser and light and it becomes a very intimidating home defense firearm most family members can use. And it is maneuverable if the need should arrive due to its’ size and nature, a bit larger than a handgun but ½ the length of a shotgun or rifle. 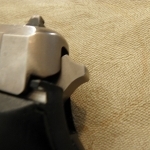 A handgun is often the most chosen firearm for home defense as it can be kept on a bed stand nearby and ready. Handguns are difficult at best to aim and fire in daylight let alone in darkness. You should have a light and laser attachment, again to intimidate and help aim. A lot of people want a revolver because they’re simple to use, but the truth is, most semi autos have a rail where lasers and lights can be mounted and offer a higher capacity magazine. Most all revolvers do not although recent developments have lasers in grips and mounted under the barrels. Despite what you may think, it often may require several shots to hit and stop an attacker. Again, the reality anymore is you may be dealing with more than one intruder. So a six or seven shot revolver may not provide you with enough firepower to deal with the attacker(s). They are easier to move from room to room, which is not the best of ideas, unless it is necessary to reach and protect loved ones. Rifles. A good tactical rifle can be used and should be considered as well. With a high capacity magazine, laser and light, you will have firepower and can deal with multiple threats or attackers. You have firepower that can meet, overcome and defeat the attack. Using frangible ammunition, in handguns and rifles, ensure your rounds are less likely to head out into the hinterlands and injure or kill innocent persons and again, this is something you need to consider when you plan your home defense. In an apartment building this would not be a good choice, even with frangible ammo. You cannot indiscriminately spray rounds in the direction of the attackers. You will be held accountable for each round fired and where it lands, yet you don’t want to not have enough firepower to deal with a multiple threat attack. In an apartment, it may be difficult to come up with the right combination without endangering other tenants in the building. In today’s world, being prepared may be and has been used to prosecute premeditated aggression. Having good defensive training, firearms, “Personal Protection” ammunition, all may be used as evidence against you; “That you were planning to kill someone and couldn’t wait until they gave you the opportunity by breaking into your home.” You being prepared to deal with these threats are evidence that this was so, in the eyes of liberal prosecutors. They don’t want you to “Premeditate” your self-defense!!! Again, buy good liability self-defense insurance to fund your defense. In today’s liberal leftist thinking, being prepared is not that anymore, but preparing to commit violence, especially if you are a “Conservative and or an NRA Member!” Really screwy thinking by Socialists of the left. Along the same thought, I’ve read that having a supply of food or hoarding supplies for your getting through a disaster is acceptable, but it is subject to seizure and likely will be seized by the government to distribute to those squirrels that didn’t hoard any nuts for the winter. It’s almost as you should expect to be punished for not being a victim. And expect repercussions for being prepped to deal with a threat or home invasion. It seems the liberal’s make it out as if being prepared means you were lying in wait to shoot that poor criminal(s) and just couldn’t wait and jumping at the bit. Really? VOTE these IDIOTS out of office!!! Things you should consider; in prepping your home for defense against criminals or home invasions there are devices that help secure your home better and protect against intruders. Better locks. Sometimes using a two inch wood screw in the door jamb and seat will make it ten times harder for a criminal to kick in your door to gain entry. Cameras that monitor points of entry and alert you to unauthorized movement and approach to your home, so you can see whether or not it is a criminal or the UPS Driver getting ready to ring the doorbell. You should think about having a quick open lock system for firearms; they’re made to scan your fingerprint or punch in a short code or even read a transmitted signal from a ring or bracelet before opening. Best to secure your firearm away from unauthorized persons or criminals who happen to be between you and your firearms, having them ready but secure. You don’t want them arming themselves with your defensive firearm. These can be purchased for handguns and long guns and used throughout the home. There is a lot to cover on this subject and that is done better in training and classroom instruction. These pointers are to stimulate your thinking and are no means all-encompassing or for every situation you may encounter. Best to plan for trouble and be prepared, no matter what those snowflakes think. Stay safe and ready. We have decisions to make. Decisions about whether we’re going to allow unabated and unwarranted destructive and disruptive behavior of the left to continue. November is coming fast and we’ll be voting. We need to create a Red Tsunami, to wash the blue tidy bowl wave down the toilet. It has become ever more apparent the left is unhinged. They just can’t handle America is choosing Conservative Capitalism over Liberal Progressive Socialism. Our country, although the left would differ and incorrectly so, has prospered under President Trump. The left would want you to believe that Obama set the stage for our current success, not Trump and his Conservative Capitalist Economics. Obama had created such a mess that I thought it would be impossible to recover in a decade, but President Trump has shown what can be done when a President loves his country and people. America First! I fail to see why that is a problem, but then, I am a Conservative, not a Liberal Progressive Socialist or in one word, Democrat. Trump won the election, bringing traditional Democrats over to vote for Conservative values. It appears that many of the Democrats constituents have realized Liberal Progressive Socialism has taken a deep root in their party and they’re not going to tolerate that form of politics. It is one step away from Communism. They want to tell you this time “Socialism or Communism” will work, as all the other countries have failed miserably, but this time they’ll get it right. Anybody offer you a bridge for sale in Brooklyn lately too, dirt cheap? Liberal Progressive Socialism is utter evil. No other word for Liberal Progressive Socialism describes what the left is and what the Democratic Party had journeyed into. People who support this form of government are EVIL! I truly believe it is a mental health disease for so many lemmings to follow along in support of this ideology. We have seen the new face of the Democratic Party. ANTIFA, Black Lives Matter, SEIU, Youth who think Socialism is a good thing, the failure of our education to teach, but instead to indoctrinate left wing ideology into our young adults and so on. EVIL! The EVIL Party’s leaders have called for violence, harassment and even for the death of our President! EVIL pure and simple. We have seen the behavior towards Political Conservatives to the point they have to leave restaurants, due to the in your face shouting and harassing. These people are lost by the wayside. It’s time to take back our country from this EVIL! We should not tolerate this kind of talk and behavior and the left’s violence that goes along with it. EVIL! Now we have a Supreme Court Nominee. Someone with honor and integrity greater than any of his political left wing opponents, now under attack, by avowed left wing “Victims” held up as if they are truth itself. The real question is are they victims of sexual assault or of the mental health disease called Liberal Progressive Socialism? The behavior of these so called Democrats has crossed the line. If people haven’t been convinced before, they should be now. Ford says Kavanaugh sexually assaulted her, even passed a lie detector test, but that test has a 77% change of error. Polygraphs are not allowed into evidence in court because they can be beaten and can be wrong. If you are a habitual liar, without a conscience, such as a Liberal Progressive Socialist, you’ll pass just fine. Ford was a “Party” girl who dropped her pants for anyone who would show her attention. The other women are left wing agitators who will lie, just as Ford is, to further their Liberal Progressive Socialist Agenda. They have no qualms in doing so. They are not like you and me, who believe in truth and the American way. The left will use whatever tool is at hand to push their politics and control over you, regardless of consequences. They only care about one thing. To achieve their Socialist Paradise off the backs of America’s hard working success stories. Remember the comment made by Obama? You didn’t become successful through your hard work; somebody had to help you do it. Well maybe in a Socialist world, but thank god, THANK GOD; we haven’t had to find out under Clinton. Take a look around the world and see what that is. Not a very good thing to experience and live with. Ask those in China, North Korea, Venezuela, along with Cuba to name a few, how Liberal Progressive Socialism works for them? Venezuela was the best economic and wealthiest country in South America until Chavez took control. Now they’re starving. It is EVIL! The Democrats have proven time and time again they lie, misrepresent facts or statistics to play to their fiddle. They have proven time and time again they don’t care about our veterans or our nation’s security, allowing illegals to come and remain in this country. They have allowed Muslims into our nation who hate and attack us. Time and time again, they have shown they HATE the Constitution, revealing that hate so much in questioning Judge Kavanaugh, so as to spat out, “That book you carry!” They can’t call the book by its name, The United States Constitution! To do so would acknowledge it exists. This is pure EVIL! I for one will be proud to see Kavanaugh sit on the Supreme Court, a judge who reveres the Constitution so much, he carries it with him as a reminder what it means to be an American. Kavanaugh is a person who is proud of his country and serves it well. He should be given the opportunity to do just that, on the Supreme Court. PLEASE call your Senators and tell them to vote to confirm. Tell the Democrats their rule of hate is over and we’re not going to put up with it anymore. Any of these demonstrations and abuse of our elected and serving officials will now be met with whatever force is necessary to stop these obscene and outright EVIL behaviors. We need to keep draining the swamp and remind the politicians, regardless of party, they answer to the people! Just as we showed them in the Presidential election. We don’t want Liberal Progressive Socialism. We want the country founded in 1776, back. OUR COUNTRY! A Republic, not something corrupted by the political left and aided in the corruption by the RINO’S like Flake and now dead, McCain. Time to remind them, this is our country. Bring on the Red Tsunami this November, but call your Senators and demand Kavanaugh’s appointment to the Supreme Court. Vote to destroy this EVIL that has taken hold throughout the Democratic Party. Make America Great Again. Back when I started Law Enforcement, I had a mischievous, not quite evil, sense of humor and one I used to my fullest capability. In the Highway Patrol Academy, (I had already been a cop 3.5 years when accepted), we had one of my fellow cadet officers not doing so well with his qualification. The cadet was shooting with his right hand, however had done everything else left handed and the instructors noted this and asked him to try and shoot left handed. 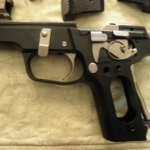 He did improve shooting left handed and so he had to walk about 400 yards from the firing line back to the Armor’s van and was issued a replacement left handed holster for his State issued Smith and Wesson Model 66. When we were back on the firing line, waiting for the instructors to come back down and start training, I looked over and acted surprised. “Tracy!” Isn’t that the revolver you were using before?” “Yes” came the reply. I continued. “Well they must have made a mistake!” says I. “What do you mean?” asks Tracy. “Well that is a right handed Smith and Wesson; they must have forgotten to issue you the left handed one!” I continued. “Oh no, I better get up there and get the left handed one!” Tracy exclaimed!! And Tracy jogged all the way back up hill to the parking lot, near 300+ to 400 yards away to get the left handed Smith. Even from the firing line, we could hear the laughter from the firearms instructors and “MURRAY. You SOB! @!” shouted by Tracy as the instructors explained he had been had! Tracy had another issue, might not have been so funny but it was caught in time. The Smith and Wesson was a Bangor Punta model and the barrel was not pinned. As the process of training and qualification continued, it was noted the front sight was canted to the right about 45 degrees. Needless to say an unsafe situation as the barrel had not been seated and tightened correctly at the factory. Tracy ended up with a new revolver after all. Another prank I often pulled on rookies and trainees later in my career was to watch their shooting and see them become discouraged for their lack of grouping, mostly because we were shooting all day long, 10 hours or more during the training process. I would shake my head and exclaim, “YOU ALL should be putting the bullets through the SAME hole by now!! !” Some would just about be cocky enough to tell me to show them how it’s done. I would offer to make a bet of a case of beer that I could put 50 rounds through the same hole on that target. They would be suspicious and say you’re going to stand right next to the target and shoot. I would say no, I’ll stand about 15’ away, but I’ll put 50 rounds through the same hole. I won the bet and would return the beer at Choir Practice. (A term for police parties.) This also was a lesson in clarifying statements or conversation for investigative purposes. Don’t assume you know what is said, but be sure it is the meaning the person intends for you to hear and understand. Of course, one should practice what they preach which leads into the next event. During a concealed carry class, I was assisting another instructor with about 25 applicants. The applicants are told not to bring their firearms into the class loaded, but there are always a few that can’t follow directions, (First hint), and during our first break, we head onto the range. “Point your pistol down range and unload it.” Came the simple instruction from the instructor in charge of the CCW class. The applicant promptly drew his pistol and emptied it, as fast as he could shoot, down range, all 17 rounds. During this process both the instructor and I are yelling for him to stop. No eye or hearing protection on an indoor range, for any of us, but we were unsuccessful in our attempt. With the slide locked back and the pistol still pointed down range the applicant asks, “Does this mean I can’t take the class now?” once he realized his misunderstanding of our intention of what unloading the pistol meant. “No” I said, “This means you need a lot more training!” and it was a reminder to us instructors of making sure instructions are clear and understood, not misinterpreted. Another CCW class and day on the range applicants were required to fire a minimum of five rounds each at five and ten yards. A lady fired her first string of five shots at five yards and we went forward to see how well she did. “Well I see you first shot was dead center, but I have no idea where the remainder of those shots went.” I said. I continued, “Are you watching your front sight and getting a good sight alignment and sight picture?” She says, ‘What’s my front sight?” I cover this nomenclature in the Concealed Carry Class as a kind of refresher and she could have asked at any time during class for me to explain what I am talking about. My mistake was assuming people have shot firearms before and have an understanding of how to shoot them, when taking a Concealed Carry Class. Especially spouses of shooters whose husbands are regular shooters and hunters. Apparently this ladies’ husband, an avid hunter and shooter, having served in the military too, had not even explained any of the basics to her as he just didn’t have the patience to. Often the only training people have is from “Watching” T.V. or from someone who is barely able to handle a firearm safely themselves. She became a pistol student in my future classes and can hit the target where she is supposed to hit it. Now, in all classes, I begin with an introduction of whom you are, your skillset and understanding of terminology. Don’t assume, ask and reassure yourself are receiving the answer you should be hearing, not what you are expecting to hear. Stay safe and ready. You have other forms of tactical training, Offensive Tactics, similar to what the military use and S.W.A.T. 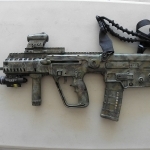 upon entry of a building and you see these tactics involve the use of long guns, such as M4 rifles and 12 Gauge Shotguns, as well as submachine guns, like the H&K MP5 series, a very popular subgun for military and police use in the 1990’s. Notice you’re not bringing a handgun into a known threat. A rifle or shotgun “Trumps” a handgun every time. The obvious observation is however, you’re not going to walk around with those kinds of firearms in your back pocket. They are great for home defense which is something to discuss in the future. If you stand still in a gunfight you have an 85% chance of being shot, and 51% chance of being shot in the torso. If you move and shoot you have a 47% chance of being hit, with 11% chance of a torso shot. Seeking cover and returning fire reduces your chance of being shot to 26% with a 6% torso hit rate. Most gunfights average 3.59 rounds per incident. Most deadly shootings occur within 3-6 feet! Usually you are within conversation distance and how far is that person from you? Usually at “Arm’s length”, maybe closer or slightly further away from that distance. Even the best of Skilled Defensive Trained personal will take approximately 1 and ¾ of a second to recognize, draw from a friction type holster, (Not from Concealment) and engage a threat. On average it takes over 3 seconds if you have little or no training and you are not practicing to be aware of your surroundings and recognizing possible threats. To survive these types of encounters requires a lot of training and practice. Unfortunately, this is the most likely situation an individual will face during a threat encounter. It may differ somewhat, as sometimes the treat may have a less lethal weapon, like a knife or club, (Still can harm and kill you), but if you have time to plan for an attack, it is under unusual circumstances, maybe like a riot, or home invasion where you’re alerted by cameras, alarms etc. Not a lot better, but still more time to implement a plan you have rehearsed with your family. Role playing and dry firing; (Please don’t have loaded firearms when doing this), reduces your reaction times in both recognizing a threat and dealing with it. This is one aspect of Defensive Tactical Training, what ifs and how to react and deal with them. There is a lot more to this, but we’re not really covering that in this article. So back to the question? How to improve shooting in competition? First you need to understand it is competition and NOT how to deal with everyday carry and the possibility of threat encounters. You have to break your habits, (Do you want to do that?) Habits learned through years of training to survive armed encounters. IDPA has some funny rules; like you can’t drop your magazine with a few rounds left in it as you move to another position to have a fully loaded pistol. Something you may or may not do or have time for in an armed threat encounter. They make you do a “Tactical Reload” putting the partly empty magazine in your pocket before charging your pistol with an new magazine, or just shooting the pistol dry, then reload and continue. You can drop the magazine when it is empty. While Defensive Training does include tactical reload training, often the attack is finished before that need occurs. If you’ve fired, moved to cover and still have a threat to deal with, my thinking is, the quicker I have a fully loaded pistol the better. I’m not entirely sold on Tactical Reloads. In IDPA and competitive shooting as a whole, you have to follow rules set down for the sport. Move here, move there, shoot low through an opening, lean this way, lean that way. If you follow your Defensive Training sometimes, it will fit in with the stages of fire found in the match but often you will find you are trying to revert to your Defensive Training which may cost you time and lower your score. So you have to choose. Am I there to win a match or training to win the ultimate competition? A fight for surviving an armed encounter. You can pick up needed skills shooting IDPA or other shooting sports, like reloading faster, getting the pistol out and presented quicker, shooting faster, clearing malfunctions and so on. This was how I polished my shooting skills early on in my Police Career. Police Tactical and Defensive Training was almost nonexistent. So you had to find other ways to improve your survivability for on the job threats. Today police are being trained and trained well, but in Defensive Tactical Threat Encounters, not sport shooting. If you’re a current Police Officer or Military, don’t sacrifice your ingrained training to try and win a civilian sport match. Just shoot to polish your Defensive Tactical Skills, within the rules of the match and enjoy. Some of the differences between sports shooting are pretty obvious, such as no “hot” guns until on the firing line and instructed to load. At the end of the stage you unload, empty and show the person running the timer, who is looking over your shoulder, you have cleared your firearm. You will pick up ingrained habits due to competitive competitions that do not apply to your professional training. You don’t want to be in a gunfight, win, then empty your gun, just as another threat comes around the corner or appears in the fight. You as a professional, always have a loaded and “Hot” firearm. It is how we train, both in Defensive and Offensive Tactics. Range safety is VERY important, but Law Enforcement and Military personal are not beginners in using firearms. Some have to be trained from never shooting or owning a firearm in their lifetime and caution is used in teaching the basics, but once they’ve advance in their career, they should know and have a developed skill set. Although I’ve met plenty I’ve often wondered about their abilities. There are a couple of different animals here. Those who take firearms training and skills seriously and those who think it is just another accessory on their duty belt. I don’t understand this mentality as it is often the difference of surviving an armed threat or having a large funeral. The problem with this thinking is as I said, you usually do not have the ability to do anything but react to a threat and let your training take over. There is one exception to this; the criminal has planned his attack and executes it on his terms and timing. Think about that. Lucky a great many of these animals, never go to the range and train. But at 3 to 6 feet, they can be just as lethal as the best trained officer or armed citizen. You’re kind of leveling the playing field just a bit, by going out and training. Maybe getting a little better advantage; but realize. Armed Threat Defensive Training and Tactics are not the skillset for Competitive Shooting Matches and as such, neither are Competitive Shooting Matches a replacement for Defensive Training and Tactics. It can polish your skillset, but they are like comparing a wolf to a dog, both similar, sometimes dangerous, but the wolf is the survivor in the real world. Stay safe and ready. As an Officer for years I carried the Sig “P” platform pistols on duty, mainly the Sig P220. I have owned the P226 and carry a P228 as a concealed carry firearm. As I have trained and used these pistols for years, don’t try and convince me to switch over to striker fired pistols such as the new Sig P320 or Glock Firearms—it’s just not going to happen. The Sigs I like to work with are German made, either pre-fall of the Berlin wall, (West Germany Marked) or post reunified Germany, (Marked Germany). 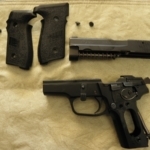 You can bet the quality of these pistols is the best out there. I look for those pistols that have little use or wear and tear and start there. You can expect to pay anywhere from $650.00 to $1000.00 depending on model and condition. Not cheap, but they are the best out there, the ones Sig Sauer’s reputation is built on. I fully strip the pistols; polish areas of moving parts, the feed ramp breech block, feed ramp on the barrel and throat the barrel slightly to aid in feeding rounds. I would first state, the standard version Sigs I’ve owned feed just about anything, but this is added insurance. I take the edge off the trigger by rounding it. 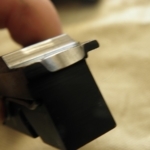 I install the Sig Sauer Short Reset Trigger Components as well. Then we change the hammer main spring from the stock 24 pound to a Wolff Spring. What I’ve found 19 or 20 pound springs seem to work the best, but you can try 18, 17 or 16 pound springs too. However, with the lower spring ratings, light strike misfires can happen and you need to use a pound rating which ensures this does not occur. Also note, the older style hammer main springs are difficult to change. They had a modern design change, which makes it a lot easier to deal with but it is not a straight change out of the retention unit and requires a different hammer strut as well as a different spring. 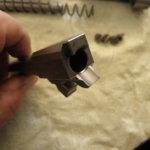 So if you pistol already has this upgraded unit, be sure you purchase the correct spring and if you’re changing out the old one for the improved version, ensure you buy all three parts, hammer main spring, hammer strut and the new Retention/Main Spring Seat. So after we’ve done the basic polishing of the parts, we send the whole pistol to Robar Companies in Phoenix, Arizona to have their NP3 finish applied to all metal parts except the anodized frame. They do not plate the sear as that part itself can be too slick for safe use. The advantages of this finish are first, it is a nickel plating that is impregnated with Teflon which makes the surface self-lubricating, reducing the overall drag and friction of the moving parts, incredibly so. Second the nickel itself is corrosive resistant, but in the desert, that is not that important. It, with the added work done prior to plating, makes for a very smooth working firearm. It is also easier to clean and maintain as shown in the photos; you can wipe the fouling off of the parts. I still clean the pistol after firing, but as slippery as the NP3 finish is, it makes cleaning easy. Here is their Website: https://robarguns.com/. After Robar has finished with the Sig, you can see how well the finish looks, besides all the qualities mentioned with NP3. We ended up with a 19 pound hammer spring and installed a Sig Number 10 front sight as my wife needed to raise the point of impact approximately four inches. The stock Number Front and Rear sights on the Sig are Number 8’s. Raising the numbers on either the rear and or front sight increases bullet height impact and the lower numbers lower the impact point. 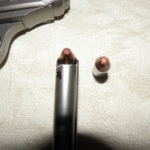 Each number difference, down or up will lower or raise bullet impact approximately 2”. Simple enough. Another change to the pistol is the addition of Hogue Extreme Aluminum Grips as they are about the slimmest grips on the market which fit both our hands best with the wider body of the double stack magazine Sig P series. 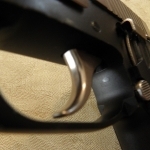 The grips are not easily marred or damaged and while if it is a constant carry firearm, cold weather may make the grip, well cold, but there’s not too much of that here in Arizona. Here is what they cost and where to order: https://www.hogueinc.com/sig-sauer-p228-p229-aluminum-matte-black-anodized. Another option that will follow and is an easy change out of the recoil spring guide rod is adding a LaserMax Green Laser which replaces the guide rod with an internal laser, which is index finger activated. https://www.lasermax.com/lms-2291g.html. The trigger pull for the Sig with a 19 pound hammer spring is now for Double Action 10.1 and Single Action 4.1. 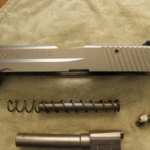 There wasn’t a whole lot of difference in reduction from the stock 24 pound spring from 11.4 for Double Action and 5.8 for single action however; double action is smooth all the way though with a very crisp release on single action. With over a pound difference between stock and tuned it feels like night and day from tuned versus stock. Understand if you don’t have the skills for these kind of modifications a gunsmith MAY know how to do this, but it seems as time goes by, there are less and less competent smiths out there, especially in dealing with older iron, versus the poly age. In training classes I see fewer hands raised when I ask if the students have handled firearms like “Revolvers.” It’s interesting and scary to see a passing of an age that I once was very familiar with and the ongoing new fascination with poly striker fired handguns. As always, we’ll stick with the German “P” series Sigs rather than try and relearn shooting habits and adjust years of muscle memory. Stay safe and ready. Well here we go again. The fight to keep our rights guaranteed by the Second Amendment and the US Constitution, those very rights the Anti-Gun, left wing liberal, Marxists-Socialists, Democrats want to end permanently. It has been an ongoing war, that’s what it is, a prolonged attack on yours and my rights. It doesn’t stop and never will stop. Understand there is no “Reasonable” discussion or dialog with these lunatics. It’s their way or no way and that doesn’t just apply to firearms, but to every aspect of what Obama openly said he was going to do, change the nation though social reform. Folks, the left have called us haters; they have called us racists and have been very successful at blaming us for their social troubles and harmful life style. They want to blame the United States for being a great nation, a world leader and country that does not take crap from other nations. They say it has been at the expense of other nations, this success of ours, that we enslaved and exploited other peoples and nations, (We’re not doing that slavery thing but there are several other nations that still do), that we have extorted at the expense of other nations and so on. That’s their excuse for their lack of success, it is America’s fault. Well heavens, after Europe destroyed itself during WWI and WWII we rebuilt much of the world’s nations off of the generosity of our country’s citizens and as of yet, have not called in the debts they owe us. So when we talk about wanting them to carry some of the burden of running their countries, now we’re evil. Look, as far as I’m concerned the rest of Europe, Africa and the Middle East can save their own asses, but if they threaten our security, we should utterly destroy that threat. Stop sending our monies overseas to those nations who look at us with hate, but still have their hands out. Of course the same Anti-Gun, left wing liberals, Marxists-Socialists, Democrats will cry colonialism and capitalism are the evil destroying the world but hey, we know the truth. Capitalism is what built the United States and made it strong and a world leader. There isn’t a nation today that wasn’t taken and settled by other peoples in colonial expansion. That was the way of the world. It is forgotten that Eastern Europe has been at the root of both WWI and WWII wars and continues to be a hot spot due to conquered cultures sharing the same borders. What I’m talking about here is gun control, but it doesn’t sound like it. You need to understand the thinking and reasoning behind the left wing. These people are not promoting your safety; they don’t care about your wellbeing. What they want is a dictatorship control over the people they govern. They do not follow the true ideology of Communism however, as that cannot exist with human nature. But it is obvious they want the power, to be the elite and in control of the useful stooges, (You), to further their agendas. Understand, the Anti-Gun crowd is a child of Marxism and Communism. It is not about making life better or even saving lives; it is about furthering their idea of what a perfect world is FOR THEM! Know that Communism, Marxism, Socialism, Progressivism has killed more people than all the wars of the 20th century, not Capitalism, not the Republic form of government, but Democracy under the influence of Progressive leadership, i.e. Socialism, Marxism and Communism. I always get a kick out of some college, indoctrinated youth commenting on when I’m calling the left Communists. They say “Lol, you don’t know what Communism is!” Well at least I had an education, not a political left wing agenda indoctrination which it seems their so called college education is reflecting and awarding degrees on. Look at all the Bernie Sanders supporters amongst the college kids and tell me I’m wrong. Look who’s been educating them for the last 60 years. And we’ve allowed it. So how can a law have stopped the shootings in Vegas? It could not and while they say they don’t want our guns, every proposed Anti-Gun Bill introduced since the Vegas Shooting does that very thing, ban or take away our rights, opening the door to outright confiscation. Well for one, I’m tired of hearing this crap and being taken for a fool. Don’t piss on me and call it rain! Crime will not stop because they’ve passed a law or thrown a magic switch. So they say, look at England, Australia and so on, we need laws like they have. Well folks they’re not telling you the full facts, all kinds of violence in these nations have gone up and people are left defenseless at the mercy of criminals. What they don’t want you to know, is since the 1990’s and passage of concealed carry laws, here in the US, violent crimes have and still are decreasing in this country. What they don’t want you to know is the kind of firearms used in Vegas are used in less than 1% to 3% of crimes in this nation. They want you to depend on the police and government for protection but that never will happen. The US Supreme Court has ruled the police and the government has no lawful requirement to respond to your emergency or 911 call. They can’t be held accountable for ignoring your pleas for help. So guess whose shoulders it falls back on? You are the only person who can stop the attack or threat to you and your family. That’s just how it is. So when you have four armed thugs kicking in your front door for a home invasion, what would you rather have for a defensive firearm? A bolt action hunting rifle? If the left is allowed to have their way you won’t even be allowed a firearm at all. But that’s all they think you need, is your Deer Rifle right? Of Joe Biden’s double barreled shotgun the wife just emptied on the back porch to “Warn ‘em” we’re armed! What you need is a firearm that has a lot of ammo capacity, one that can meet, stop, overcome and defeat the attack. Sorry to say for you in the revolver crowd, your six or seven shot Smith won’t be enough. Maybe a double barreled shotgun like Joe said? Might be okay for one guy, maybe, but it’s empty remember? Having a good tactical rifle or high magazine capacity pistol is a minimum for this type of threat. It doesn’t matter how good a shot you are or how much you practice, the facts are human physiological reactions to danger kick in and as such you lose the fine motor skills, with the flood of adrenaline, tunnel vision and such to name a bit of what happens. Very few people can handle that kind of situation with a calm approach. Our human bodies are not designed for it. So the so called, Anti-Gun crowds who say you don’t need high capacity magazines or those tactical rifles that have no other purpose than to kill as many people as you can, well honestly, they’re right to a degree, you need that kind of firearm for your self-defense. The difference is YOU are an HONEST and LAW ABIDING citizen and have every right to have the best defense possible against a violent criminal attack you can afford at your disposal. I like the looks on their faces when I tell them that’s what I have these firearms for, the best available defense possible at mine and my families’ disposal. It’s what the police use in dealing with criminals so why should you sacrifice the best firearms that can be used to protect your loved ones and yourself, just because you’re not a police officer? I ask them what does the Secret Service carry or other armed security for our nation’s leaders rely on and they don’t know the answer but often say the political leaders are important and deserve that type of protection. Well what about my family or your family, aren’t they important too? Their arguments are hollow and they resort to the usual left attacks like cursing and calling you a fascist or some other nasty words as they can’t follow your sensible argument. I further explain that the founding fathers created the Second Amendment so our nation’s citizens have a means to resist the very kind of government they’re attempting to force upon our Republic. We do not want a Socialist Regime that controls every aspect of our lives and leaves us at the mercy of criminals, which is what England and Australia have become, along with several other European nations who are subjecting their citizens to the threats of Islam. What is interesting is the former, under Soviet Control, Eastern European countries like Poland, Croatia, Bosnia, and Ukraine to name a few have refused the European Union’s call to have stricter and tighter gun control, including registration of firearms. They flatly refused to enact or bring changes to their new constitutions to accept the EU’s totalitarian control of their new nations. They’re too fresh out from under Communism to go back under the Socialist flag. So to resist the Left’s ideas about sensible gun control, TOTALLY, is our only course. Call your representatives, call Trump’s White House and tell them no! NO more gun laws and get on with passing Reciprocity as Constitutional rights do not stop at state lines and pass the Hearing Safety Act so possessing Silencers and Suppressors are not a NFA controlled item. Do not let the Anti-Gun arguments sway you; do not think they have your interests and safety on their minds, that’s not it. That’s your job, not theirs, as the US Supreme Court has already noted. What they want is total control. Let’s not let them have it. Make sure the NRA, who jumped too quickly in saying Bump Stocks should be illegal and BATFE should have never allowed them into being legal to purchase, knows how you feel about caving in to the left! Call the NRA and tell them to stop selling our rights away. We already know the left is not someone we can negotiate with and honestly, we won last November, didn’t we? Time to start making our “Republican” politicians to start acting like we won and stop treating the left like we need to include them in with our agenda, we don’t want their idea of what America should become. Make America Great Again is a positive statement. Let’s do it and start by stopping the left’s attempt of “Progressing” their/Obama’s agenda. No thanks, I’ll keep my guns and money, you can keep the change. I’m afraid our country is headed towards dark times and this is no time to discuss ANY kind of gun-control or cave in to the demands of the left. All they’re looking to do it disarm the masses for control. They won’t say that and of course they’ll say thinking like this is paranoid, but I’ve watched these “Progressives” progress since the 1970’s and honestly, all they’ve done is succeed in tearing down our nation and turning our people against one another. Time to “Stand and Fight!” Stay safe and ready! In using computers and being on line I’m not that new to the idea. I Started way back when you paid to dial up with a modem. However, I’m relatively new to Facebook and that has always been a privacy issue to me as why would I want to join? I never wanted to seek out and post my laundry on line for anybody to read and comment about. I never felt the need to cultivate friends though the internet, but we’re expanding our home based business, azgunsandtraining.com and were told that in addition to our website, get on Facebook. I’ll say I’ve been missing out on some interesting news and information, now that I’ve joined, but my strong beliefs and support of the Second Amendment, causes me pause. My politics are conservative and strongly so. What I’ve found and feel, it’s good to see a large group of like minded individuals, standing up for what they believe in. Especially amongst the new and younger firearms’ owners, learning and seeking out new skill sets, becoming avid shooters and strong Second Amendment supporters. Now for some observations; Mistakes are often repeated and many times I wondered why I see “New” ideas that have been “Recently” discovered that I have “Seen” years ago. In my firearms classes I heavily teach you to keep your finger off the trigger. In all the training I’ve ever done, as a Police Firearms instructor, as a tactical instructor, range officer, you name it, been there and still doing it. There is a reason for repetitiveness training and instruction. Yet during my career, we had an accidental shooting, (They don’t call them that anymore, they’re called “Unintentional Shootings”), when a highway patrolman was making an arrest and had a reflex shot fired killing the suspect. Under stress, what one hand does so may the other and the officer had to fight the suspect, finally drawing his Sig Sauer and pointing it at the suspect who surrendered. The officer grabbed the suspect with his left hand and spun him around and bent him over the trunk of the car with is pistol still in his right hand and finger still on the trigger. When he grabbed the suspect’s shoulder to position him better the Sig fired and killed the suspect, shot though the back of the head. The squeezing of the left hand together caused the right hand to contract and he pulled the trigger, never intending to shot or kill the suspect. All that stress, all that adrenaline, the loss of fine motor skills, that’s what happens in a fight or flight situation. What I’m getting to, is I have an old WWII photo of a German soldier talking with a squad of other soldiers with his Luger out. In the photo, you see his trigger finger extended rigidly alongside the pistol’s frame, the pistol pointed to the ground in a safe direction. Retraining our officers commenced after determining the factors of the shooting were known and again, it was emphasized, finger off the trigger! Something new, but something old and should have been remembered, as that highway patrol officer had been trained and retrained throughout his career, never to do that very thing that killed the suspect. It should not have happened. But that’s not what we’re talking about here. I have served in Law Enforcement for going over four decades now and maybe it’s an old habit, but I take my privacy and security very personal. Very few friends will be privy to who I am, my martial art skills or even what I did in the Army, what I can do now and just exactly how many firearms we own, how much ammunition for those firearms or where all my interests in life are placed. I will say, it will give the liberals a heart attack, but luckily for them, I’m one of the good guys, just as the majority of you are too. However, I believe personal privacy is paramount and goes hand in hand in personal security. I’ve been shocked by the amount of information gleaned from posts and pages from the now friended users of Facebook and the groups I’ve joined to further those interests I have, most of which have to do with firearms. I understand the nature of people is to want to believe the best about others and to trust them, but that really is a mistake. Even the most trusted of friends can violate your friendship. Some may do so unintentionally, others because they think you seriously wronged them in some manner. The same applies to your family, your cousins, in laws and sometimes your brothers and sisters. Your politics may differ greatly and they may hate you for it. Do not post or tell someone where you’re going, when you’ll be back and update while you’re out on vacation. Don’t post that you’re eating here or what hotel you’re staying in; don’t be taking pictures of the food you’re eating, (Really?) and so on. A lot of people post or text while their events are ongoing during their time out as it is being done, like we’re eating at this restaurant, lots of good food and it automatically shows up on their page as where they are right now. They just got to have those “Likes.” Why not wait until the vacation is over and then talk about how much fun you had; don’t offer any of that information before or during the event. Thieves are looking for that kind of information and it doesn’t take much to figure out where you reside these days. Just an internet search away! While we all like a good deal, don’t post that up on Facebook. Don’t be tempted to price your item. You’re just advertising you’ve got something to steal! Remember that commercial when the young lady tells her friend about the couch she “Just had to have”, “It’s so you”, says the other lady, then later two guys are burglarizing the house saying the same thing? It might be hard to resist the temptation, but you shouldn’t blow your own horn, how much you paid or worse when you’re not there so the crooks can be stealing you newly acquired treasure! Don’t post you’re going to attend this event or go to that party or shooting match. Or even when you’re going to someone’s wedding or funeral. It’s sad at the passing of a loved one, but you’ve already called those who you want to attend the funeral, so why not wait until after the services to announce their deaths in the paper or social media? Talk about how much fun you had afterwards and certainly don’t say we’re going to be there next year too, same time, same place! There are a lot of great devices available to defeat thieves. Doorbells that connect to your smart phone by video so you can see who’s at the door and even answer while you’re away; giving the appearance you’re home. Thieves are catching on to this type of technology, but it gives you an opportunity to call 911 and have the police respond to your home to catch them. So now when they see this configuration at your front door, they’ll go and knock on a window somewhere to see if you really are home. There are security devices that react to loud sounds and/or motion. There are outdoor cameras that see in the dark and provide excellent resolution so the criminal can be identified, so most likely all but the dumbest criminal will move on to easier pickings. There are great home security systems, lighting systems, alarm monitoring systems that are affordable for you to consider for your family’s safety and home’s security. But don’t go posting on line, “Look at what I bought” and start showing how great your system is. Again, you’ll be aiding the thief in defeating your system. Yes they learn from their mistakes and improve on their capabilities too. Don’t give them that edge. I’ve seen people post that they’ve got a lot of collectible and antique firearms but only a lousy locker to keep them in and need to get a safe. Or they post photos of their firearms collection sitting in a cheap locker which is their attempt for security. It might keep an unauthorized child from getting to them, but showing the thief what you own and what it’s kept in is a mistake. While you’ll enjoy the “Cool” replies and likes, and it is very unlikely you may be a victim of a crime, it can and does happen and it’s no longer just word of mouth, but lots of social media posting and bragging. I myself worked too hard to make it easy on the criminal to obtain an easy addition to his income, so I don’t post my guns on line. 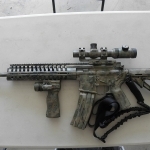 I am an FFL dealer and you can bet I have firearms, but most of what you’ll see for sale are the photos of consignment firearms where I took the pictures to sell and returned them to their owners so I would not be responsible in the event I am victimized. It also keeps them secure from becoming common knowledge to the thieves as they’re dealing though my business and I am the point of contact for both seller and buyer. You can say let the bastards try and I’ll be ready for them when they do. That’s fine, I feel the same way, but I won’t make it easy for them. They’re catching a lot of these neighborhood thieves through technology that was cost prohibitive for most people 10 or even 5 years ago but now affordable. Realize many local burglaries are committed by your neighbor’s teen aged children and technology is and has been a great aid in apprehending these budding career criminals. They may catch them, but often it’s too late for you to recover any or all of your property. Don’t make it easy on them by broadcasting where you are and not are, by showing what’s valuable to you and how easy it would be to steal. By all means enjoy your fun, let your few, in person friends who you trust in on your recent acquired toys and fun. Know that’s still risky, but my few friends know better than to go about telling everyone else about what I own and they expect the same from me. Understand too, a great many of these friends are law enforcement or longtime friends I’ve known for a very long time. Always remember, social media, is social. There are a lot of people viewing your posts and those are forwarded on to others and so on. Clicking on the post will often being up the person who made it, their page, showing what town they call home and then it is just a few clicks away to actually knowing where you live. A lot of people have been victimized by thinking everyone else is the victim and it won’t happen to me and they’re “Friends.” More people than your “Friended”, Facebook friends see your posts, especially when you post to a group site. The bad guys are watching too, not just here, but those who hate us in other countries too. Take care, stay safe and ready. I’m going to be adding points of instruction which you may find useful or may not to this column and pass that on to you for your experience and skills. Please pose questions in relation to firearms and training to us as we’ll try and answer them with in our expertise and help you along, so check back often. Pose your questions to; murraysfirearmsandammunition@gmail.com. Simple enough title for this article, however here is the explanation. Back years ago, maybe before some of you were born, (Jeesh, never thought I’d be saying that! ), I started my law enforcement career in 1977. The police department issued Colt Police Positive .38 revolvers, but allowed you to carry whatever you could qualify with. (It pays to be the department firearms instructor and armorer!) I elected to carry a 1911A1 Colt Series 70 45. I worked there over three years, nearer four and left to go to work for the Arizona Highway Patrol. They issued Smith and Wesson Model 15 .38’s but again, along as it was on their approved list, you could carry a Colt or S&W revolver and I carried a Smith Model 19 .357. When the Smith Model 596 came out I switched to that and about the same time, the Highway Patrol began to authorize off duty carry of approved semi autos and I carried the 1911 again, off duty. Before that we were limited to a Smith and Wesson Chief or Colt Detective, little five and six shot .38 revolvers. 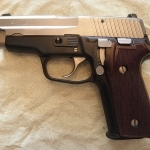 In the mid 1980’s the Highway Patrol started the switch over to a modern, semi-automatic handgun, which was either the Sig Sauer P220 in .45 or the P226 in 9mm. I, of course, chose the .45. 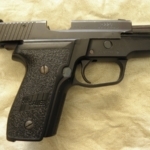 I was already familiar with the Sig P220, as it had been marketed prior in its European form a few years before as the Browning Double Action or BDA. I eventually got rid of it, although I was very happy with the pistols design and function, but no one, I mean no one, made holsters or provided spare magazines for the new import. The only problem encountered with the switching over to the Sig automatics was the Highway Patrol did not have enough funds to provide the pistols to every officer. So what they came up with was issuing them to the senior officers first and the cadets in the academy. We officers with five to ten years on the department would have to wait. I didn’t and I purchased my own Sig P220 for a whopping $365.00! Before I qualified with the pistol, I did some Gun Smithing, polished the action, rounded and removed the ribbing from the trigger, bobbed the hammer and sent the barrel out to Armoloy for plating in hard chrome inside and out. The slide and other metal components were sent to Robar in Phoenix, AZ for NP3 plating, which is a nickel impregnated with Teflon, making it a very smooth and self-lubricating surface. Thus increasing the already reliable Sig’s platform to ensure near 100% performance and function while reducing wear and tear on the pistol. At my assigned duty station, in Kearny, Arizona, I founded the Copper Basin Sportsmen’s Club. I was its president and match director, chief instructor and range officer. I became involved in the early start of the now highly competitive sports involving pistol shooting and later three gun matches. I spent a lot of time and money shooting in these events, always with my Sig Sauer P220, as it was the pistol I carried and depended on as an officer. I did not build any race guns and even though handicapped in such a manner in competitive shooting, (By my own design), I shot well enough to win several matches, advancing to a Master Class Shooter. At that time I was reloading, casting, sizing bullets and shooting so on to the tune of 1000 rounds a week to obtain the level of skill needed to compete in the matches. Not just at the club, but several other ranges and matches across Phoenix, Tucson, Casa Grande, Coolidge, Florence and Catalina, where we have one of the finest ranges available, The Pima Pistol Club. I competed in these matches with my Sig, good old stock carry pistol against the hotrod 1911 shooters. Today you will find often matches held for Street Carry Guns Only, which were not offered back then. I guess what I’m getting to, is I depended on this pistol for my life, if I should encounter an armed threat in the line of duty, I wanted to be the one who came out on top. Often my partner was 45 minutes away in his assigned area and maybe, if we needed help, we could rely on a local police officer or county sheriff to respond, but often it was just you. So you can bet I was going to know how to shoot that pistol. Over the years, since the mid 1980’s, I believe I have shot near 60,000 rounds though this P220. Granted most of the competition ammunition I loaded were reduced loads with a 200 grain lead bullet, but never the less, I had to shoot and qualify with the Sig using department training ammunition four times yearly. On average 400 rounds, 50 practice and 50 to qualify at each training session. I used the pistol faithfully until they issued .40 Sig Sauers, in the later 1990’s. While I had finally been issued somewhere in the late 1980’s a department Sig Sauer P220, I still carried my Sig. The department Sig was kept so I could purchase it upon retirement. When I had to turn it in for the .40 Sig, I didn’t like the .40. When I retired I declined to purchase the .40 Sig at “Market Value”, not because it wasn’t a good pistol, but for two reasons. I am an FFL and purchasing a new Sig for me was well below the “Market Value” offered by the department and the second reason is it was also a .40. My logic was I had so much invested in the .45, I didn’t want the expense of obtaining all the needed components for reloading and so on. What is discouraging was I had been injured of off work and decided to retire and did not have access to our department’s internal emails so I missed a law change. Law change? Yes sir! The state legislators had passed a law stating we could purchase either our rifle, shotgun or pistol for a dollar starting 04/01/2000. Before it was required to sell them for “Market Value”, to the retiring officer. Of course I had set my retirement date as 03/31/2000 and everybody had assumed I knew about the law change so no one told me. I would have taken that Sig .40 for a dollar, but likely would have chosen a Colt AR 15. I would have likely sold them anyway as I wasn’t fond of either and didn’t like the department issued Remington 870. I carried an HK 91 in .308 for my patrol rifle, authorized, but not supplied by the State. So I retired the P220 I had carried in the safe and picked up a Sig P228 and started carrying it. It didn’t have anything to do with full size or compact, being a concealment issue. The truth is, the Sigs are not that much difference in size. What I was considering is I was riding a motorcycle, and wanted the extra magazine capacity and penetration the 9mm offered. There really is not one pistol size or cartridge that fills all needs. There are a lot of things to consider and you try to accommodate the best percentage of need to be fulfilled. Well about six years later I started working part time at a shooting range and gun store, (Gee imagine that), and they authorized you to carry armed and ready on the premises. You had to qualify monthly, the same police qualification I had done for pretty much 23+ years. I picked my Sig P220 again, as the .45 is the man stopping round all others are held up to for comparison. In the store, I would be up close, no cover, no car doors but face to face with any threat I might encounter. So again I picked the pistol that most suited my needs—the Sig P220 in man stopping .45. At my first qualification I maxed and outshot the other employees in the store. Realize, out of about ten employees, seven of us were retired officers from US Marshals, US Customs, Department of Corrections, and Tucson PD. This is a reflection of the years of training and shooting that P220, intending to survive an armed threat encounter. So let’s talk about the problems encountered with the Sig. It really didn’t like the 200 grain semi-wad cutter bullet but that was an issue I worked out and finally ended up with reliable function, after adjusting seating depth and using a taper crimp seating die. The Sig shot everything else with no issues. During one qualification, at the gun store shooting range, I had the slide stop spring break. Okay so I called Sig and ordered replacement springs for every one used in the pistol. I asked Sig how often should replacement occur? Oh, about every 5000 rounds or so was their answer. Well with close to 60,000 rounds fired though that pistol I think that says something about the reliability of the Sig P220. 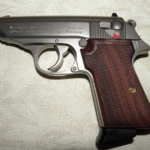 Especially the German ones as all my four Sigs are either West German or German made pistols. On the outside of my P220, you have the normal holster wear on the anodized frame’s highpoints, which are now shinny aluminum. The frame is solid and no signs of fatigue or cracks. 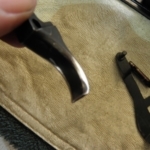 I replaced the takedown lever as it was loosening up from where it is riveted to the pivot point. 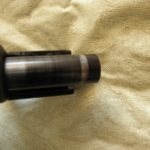 The barrel shows very little wear due to the hard chroming as does the slide which is plated with NP3. I replaced the Night Sights as they only last about ten years before fading out. The original sights were not Night Sights but I had change those years ago for the night sights. 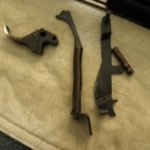 Other parts, not worn out but replaced, are the trigger components replaced with the Sig Short Reset Trigger grouping. All my Sigs have had this conversion. We added Crimson Trace Laser to the P220’s and have Laser Max laser guide rods in the P228’s, simply because the fatter grip on the P228s do not fit our hands with the Crimson Trace Laser grips. I have built and all four of my Sigs and one of the reasons we have four of them is my wife shoots my original carried P220 like a pro. I told her I would build her one but better, now benefiting from my years of acquired learning and understanding of Sigs. I did this, but guess what? I still don’t have my old buddy back. It’s in the family and the new P220 I built is near perfect in my eyes. Again, I built the P228 9mm Sigs and my wife also has one of those too. It’s nice to have a wife who doesn’t cringe or worry about how many guns we have. She is an NRA Instructor to boot! She’s taken guys, sorry. But we’ll teach your other half to enjoy shooting and it might be more comfortable being taught by another lady. People may say, Glock or some other newer design striker fired pistol it better than the double single action Sig Sauer and so on, but after years of carry, we’ll never switch. The cardinal rule is simple. Train and carry what you train with. You have set memory patterns conditioned to the firearms you use and train with and while you can break those patterns, the alternative pistols have no real appeal to make us go through the change. The investment to retrain those memory patterns is not worth the cost or time need to obtain the proficiency needed that we already have with the Sig. The Sig will win the day for us. It has proven its reliability beyond any doubt, still functions and is very accurate, something the P220 is already well known for. 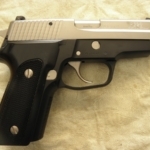 The old saying, you don’t fix what isn’t broken holds very true with the Sig pistols. Enjoy your Glocks, S&W’s, FN’s, 1911’s, KK’s, Walther’s and Revolvers, if that is your thing—they’re not bad pistols. But they’re not Sig Sauer either. For more photos head over to our Facebook Page, Murray’s Firearms and Ammunition, LLC. This is a doable project but if you don’t have the tools, patience or skill, it is best left up to someone who does. It was a pain in the neck, as the original thought was these items would simply mean replacing the Shockwave’s fore grip. As with any new idea, the accessory world will need to adapt to the fitment to the Shockwave. The reason we’re attaching the Magpul fore grip and Laser Lyte Rider is simple. In the darkness of your home, it will allow you an almost positive strike on the threat. Without the laser, you still have a better option than the pistol or revolver, but you can miss. Having sighting aids like lasers and firearm mounted flashlights improve your odds at identifying the threat and taking out the attacker, saving yours and your loved ones lives. Anything you can do to improve those odds is better and the Mossberg Shockwave stands to be a big plus for that very tool needed for surviving a home invasion and attack. Offered in our listings under shotguns for sale.